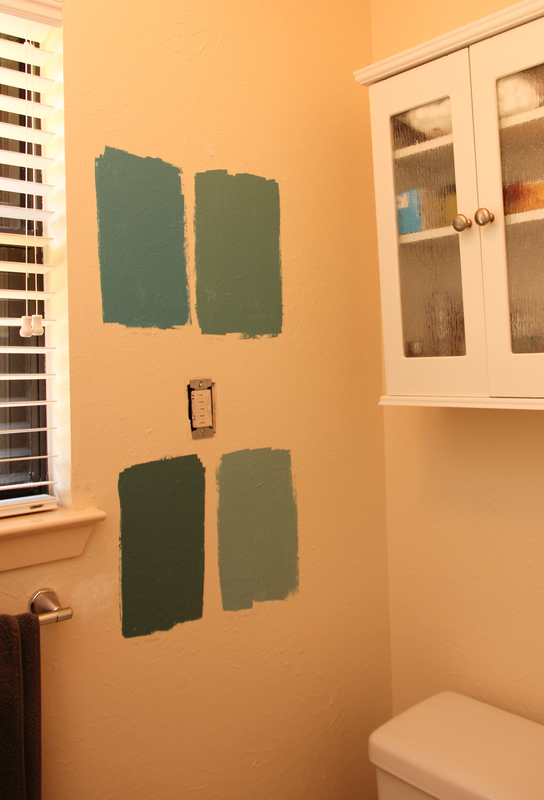 I tested four dark colors in the bathroom, narrowed my options to two, and then tested them on the wall behind the bed. 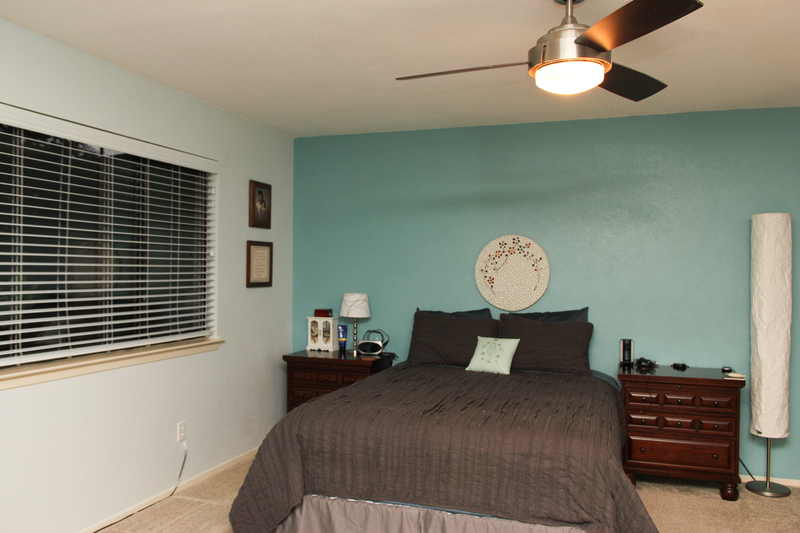 I settled on white ceilings, and selected Valspar Lyndhurst Duchess Blue for the dark color and Valspar Halcyon Blue for the light color. 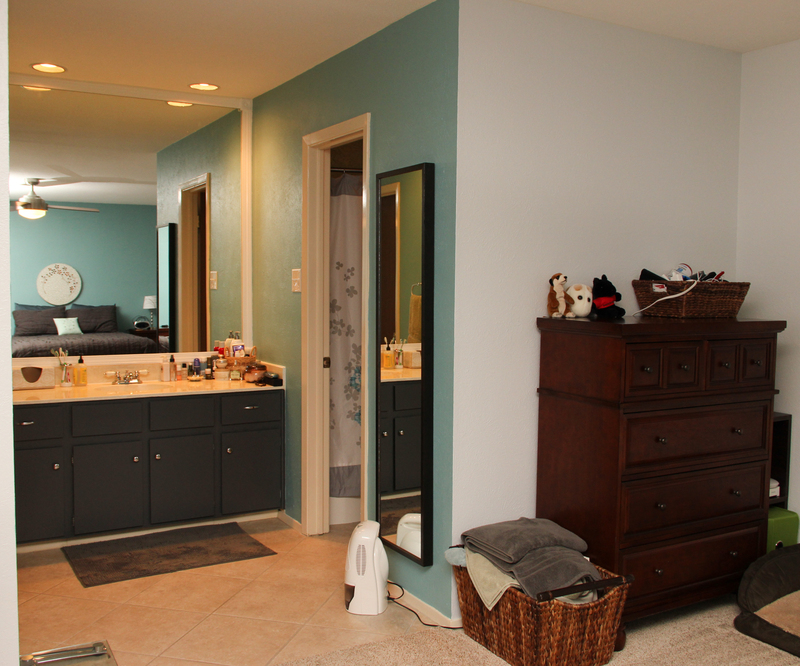 Despite its name, Halcyon Blue is more of a light gray color. In some light, it almost looks white. Even though I decided to stay with white ceilings, I’d still like to try painting a ceiling a non-white color in one of our rooms. 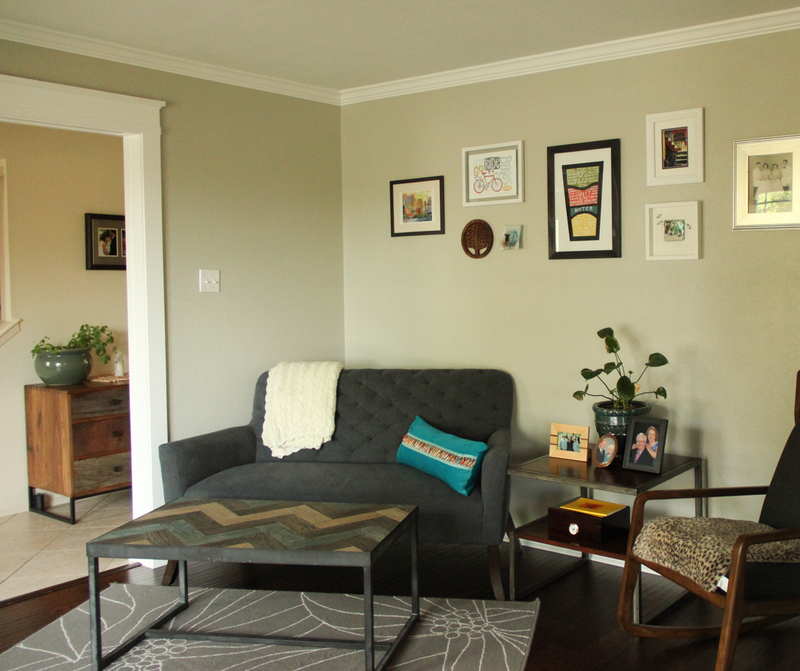 The after view – we finally hung some things on the walls! 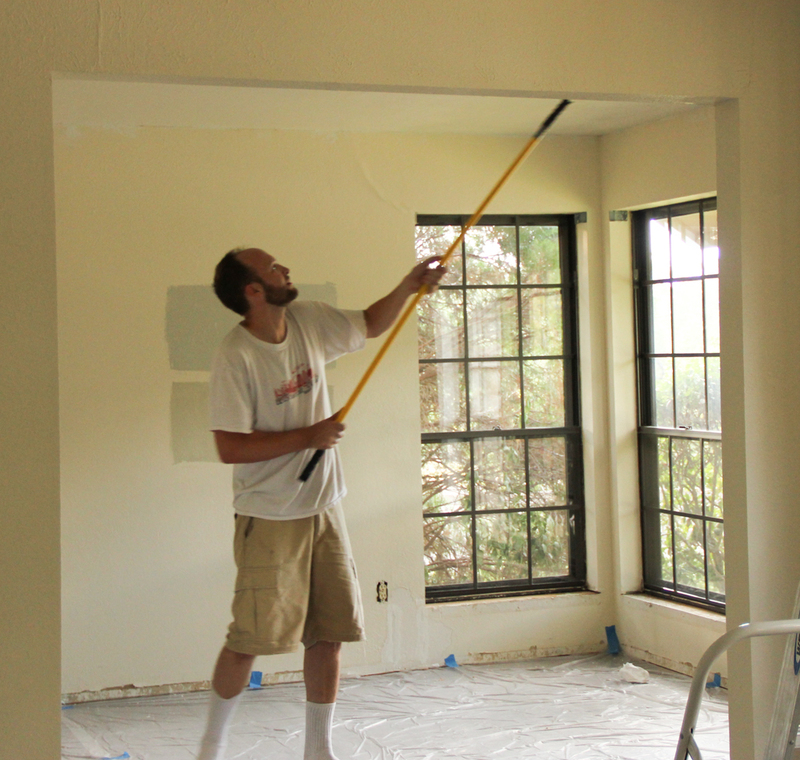 We still have to replace all of the trim in the room and paint it white. 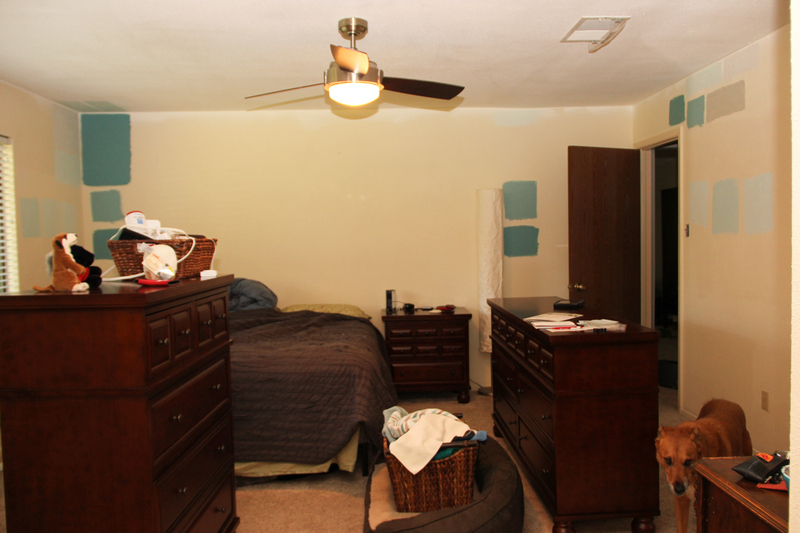 You can see the ugly light beige colored trim in most of the photos. It’s peeling and it’s ugly and I can’t wait to get rid of it! 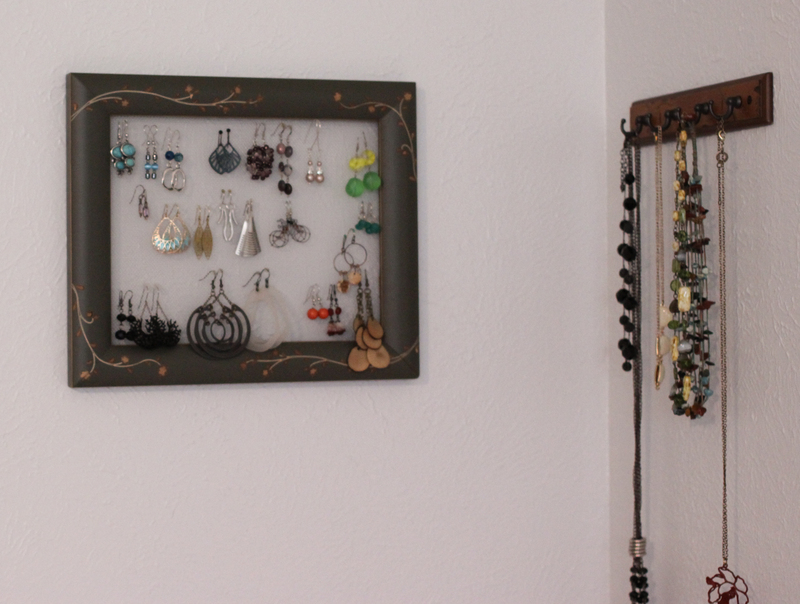 While I was hanging things on the walls, I took an unused picture frame, removed the glass, and glued in a piece of metal screen so that I can use it as an earring holder on the wall near the hooks that I hang my necklaces on. Guess what! 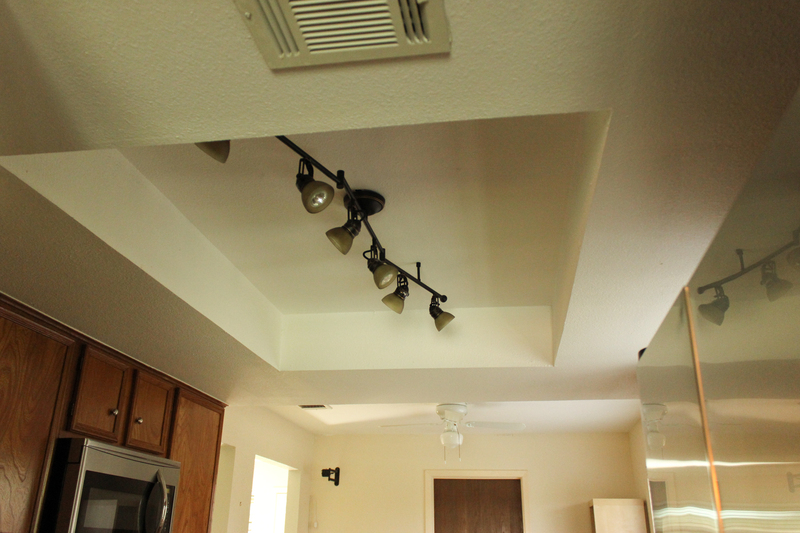 We finally did it – had the rest of our downstairs popcorn ceilings removed! 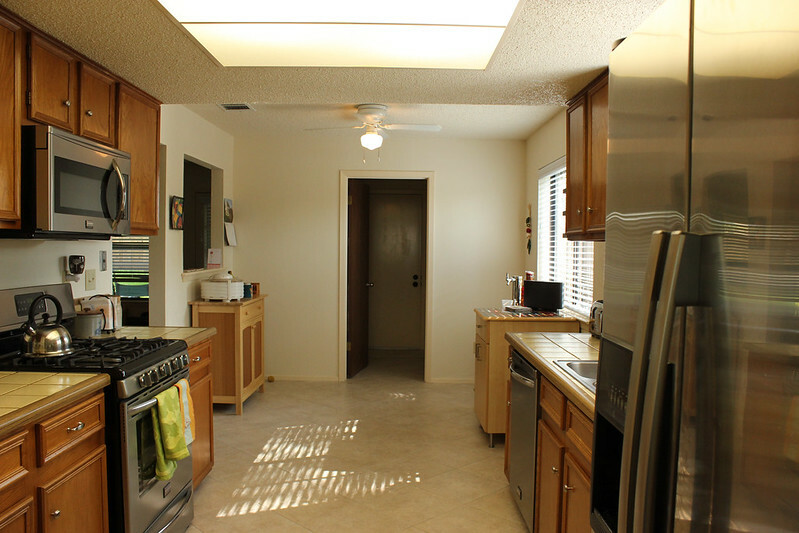 In the aftermath, we also painted the entryway and the living room to match the sitting and dining rooms, and replaced the hideous kitchen ceiling light. 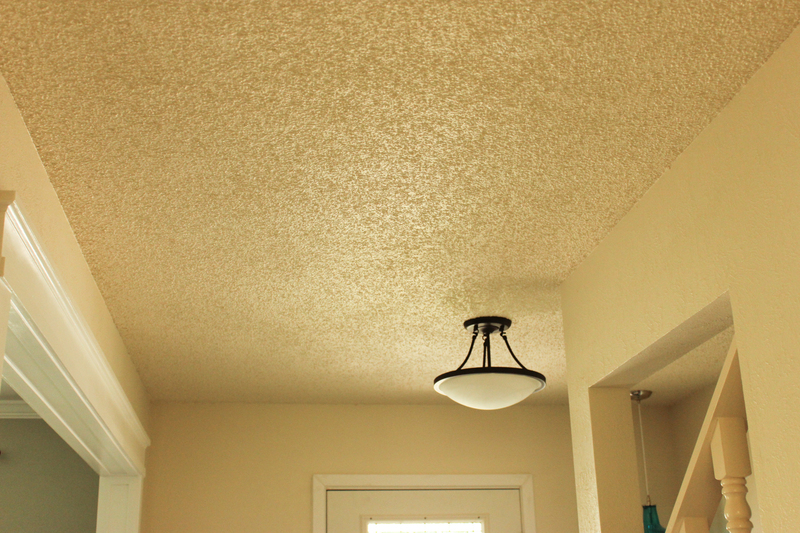 We paid a contractor to remove the popcorn ceiling texture, reapply a much lighter orange peel texture and then prime and paint. 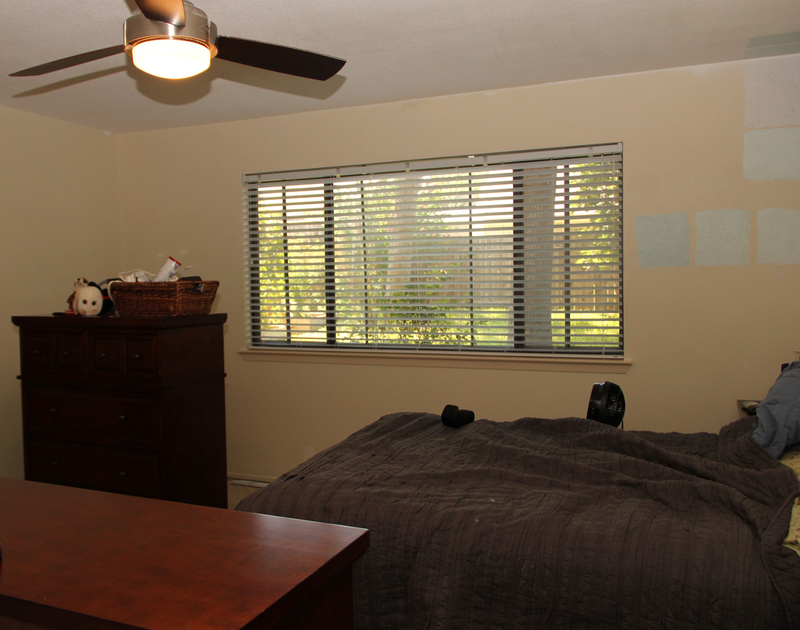 The square footage of these rooms was just too much for us to do on our own. And because the texture in the sitting room and dining room would no longer match the rest of the rooms, we also had them apply matching texture over what we had already done ourselves. 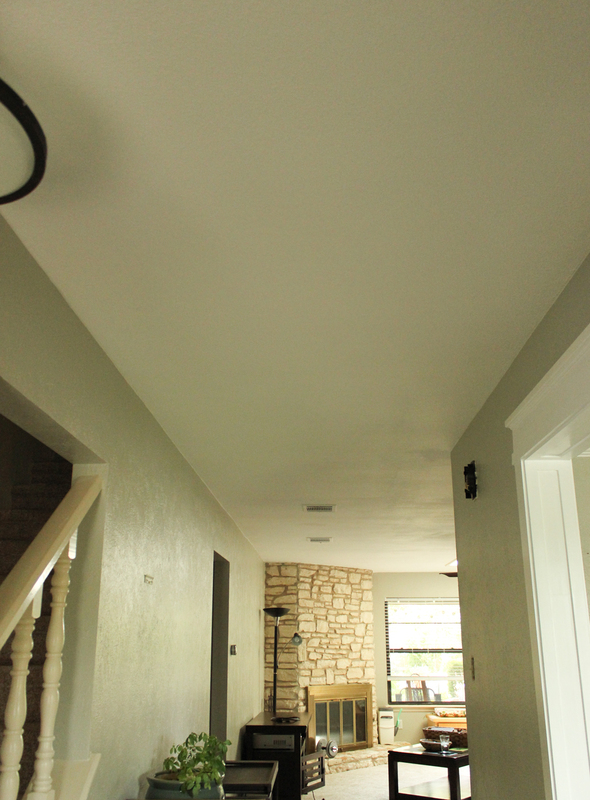 Our new ceilings are SOOOO much better than the old popcorn texture. 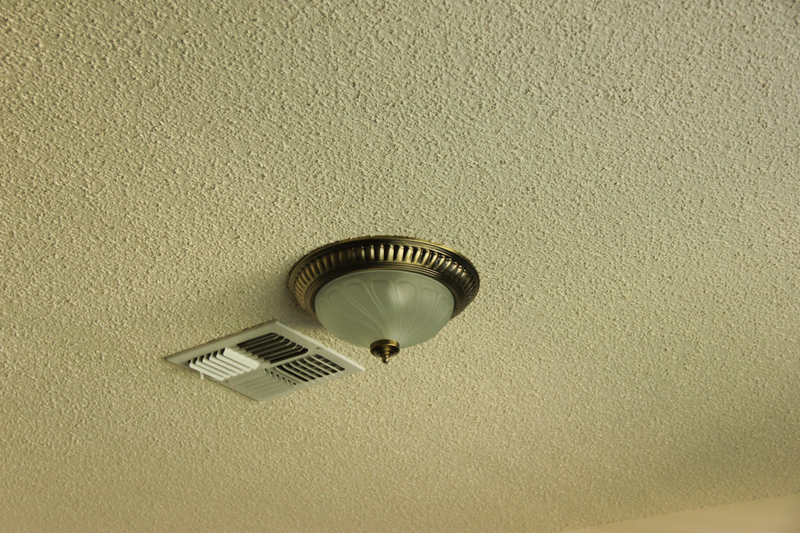 There are a few places that are less than perfect, but they aren’t really noticeable unless I show you, and I suppose the only way to have perfect ceilings is to have that texture applied to a brand new house. The part that I was most unhappy with throughout this process was the clean up. I was under the impression that the house would be decently clean when they were done, but we had to clean the floors multiple times, wipe down doors, clean windows and we continue to find splatter on surfaces. When they came back on Saturday to finish some touch up, we had already cleaned on Friday and then they left a mess again… sigh. 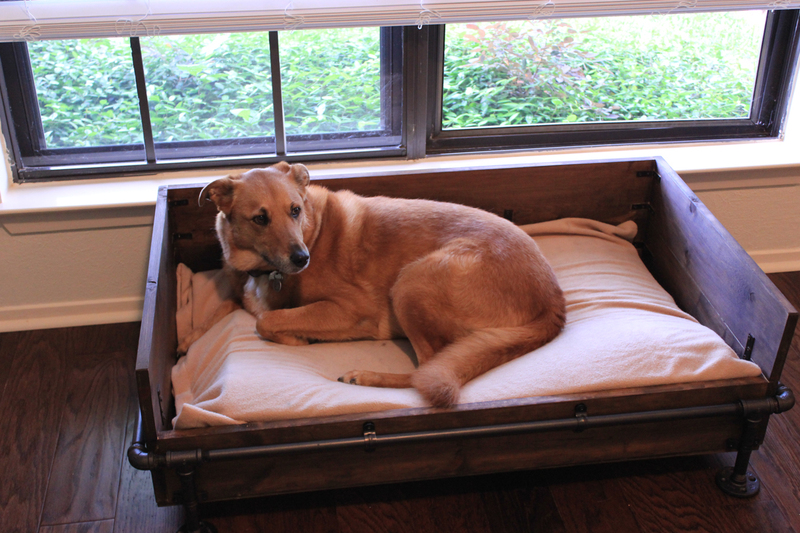 I know that’s the way these projects work sometimes but I hadn’t factored that into my plans. 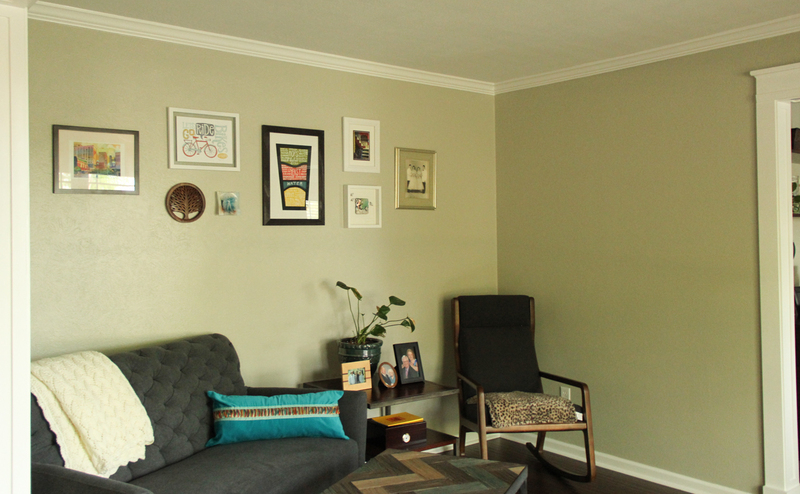 On Sunday, while the furniture was still in the garage, we decided to paint the entryway and living rooms. It wasn’t something we planned to do immediately, but since we had the supplies, we decided to go for it. 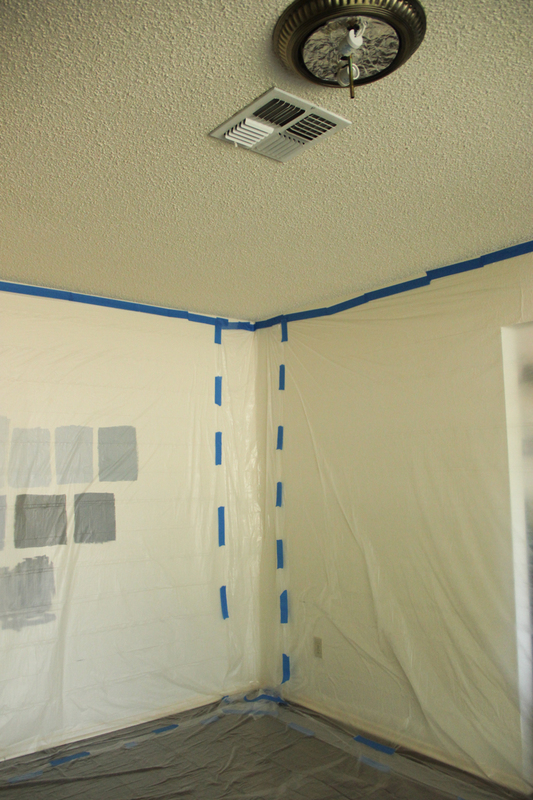 I’m glad we did, because it covers up the overspray from the ceiling paint, at least in those two rooms. 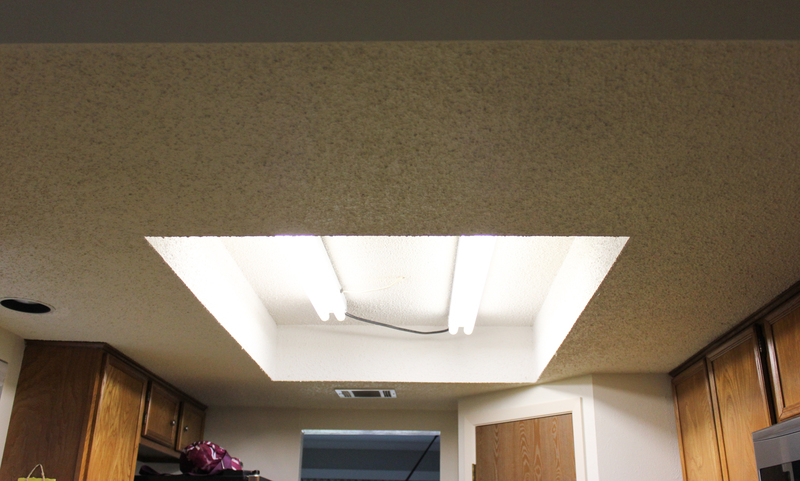 We also decided to remove the kitchen light fixture from our drop ceiling so they could texture the inside of the light cavity, and then we installed a new track light we picked up at Lowe’s. It’s so much nicer! Eventually, I’d like to renovate the whole kitchen and knock out the drop ceiling, but this will hold us over. 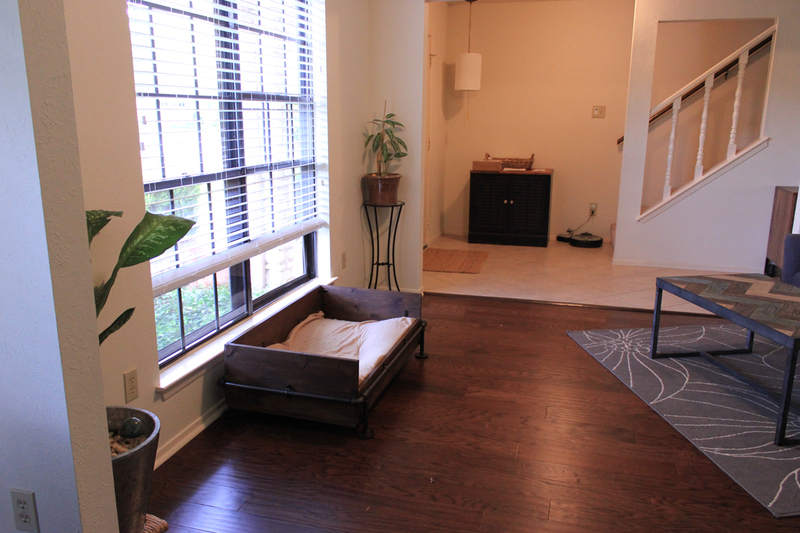 Our next house project is hopefully to get new wood floors where we have carpet downstairs and get all of those ugly, peeling baseboards replaced with nice white trim like in the front two rooms! I. can’t. wait.! So this project was a long time in the making… like August 2013 until March of this year perhaps? Probably because we could only do it a bit at a time and I was hesitant to call it complete before I did things like hang curtains. 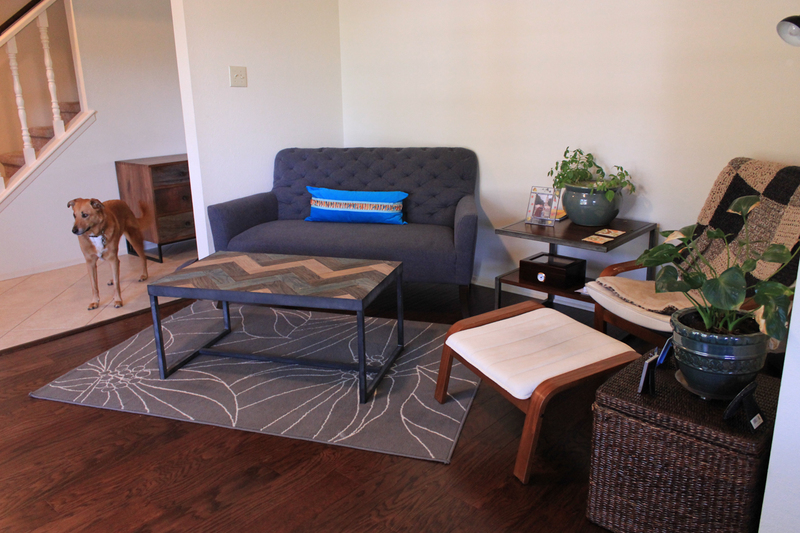 Of course, it’s not 100% complete because I still have two or three minor decor tasks on my mind. 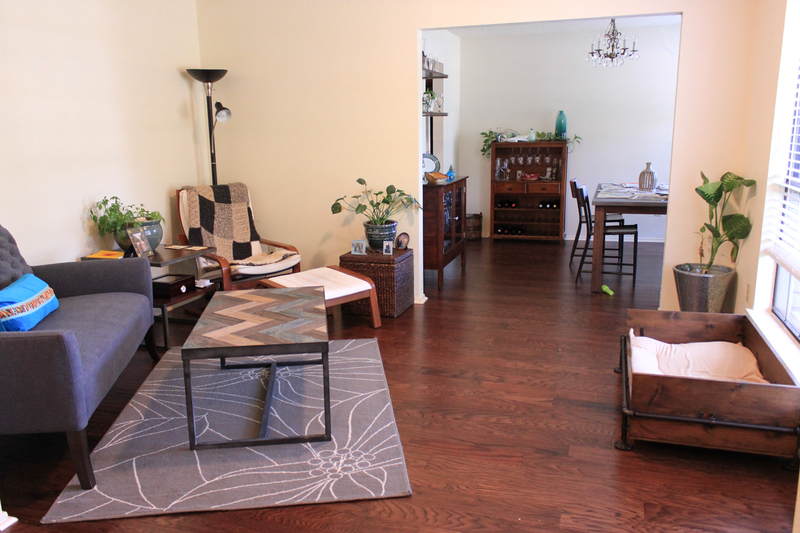 The two rooms we renovated are the ones in the very front of our house – the dining room and what we call the sitting room (we have a much larger living room in the back of the house). The entry way also got a bit of love, but not nearly enough as you’ll see in a bit. 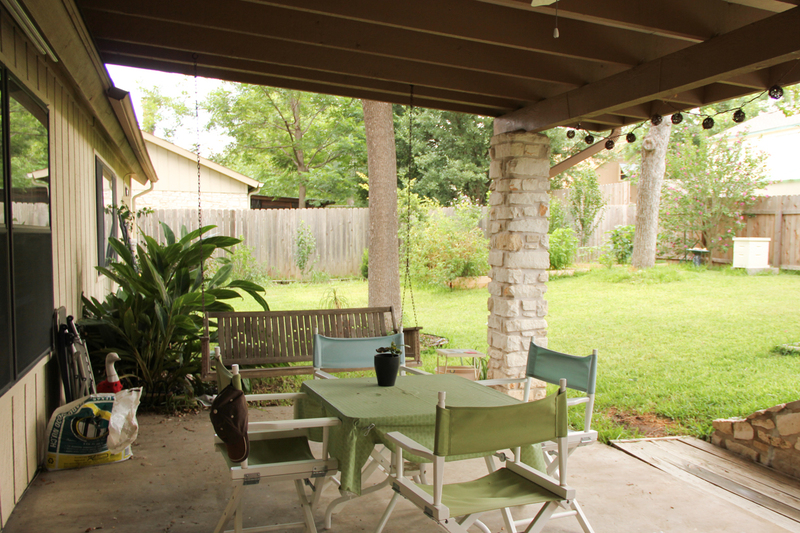 And a view back towards the entry way. 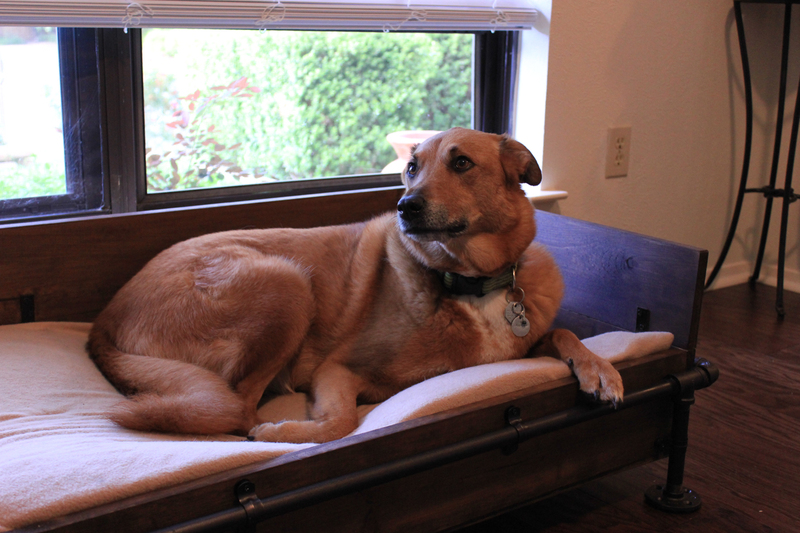 I think I was taking photos of the dog bed that I had just built. The planning of my front room renovations was quite a while in the making. 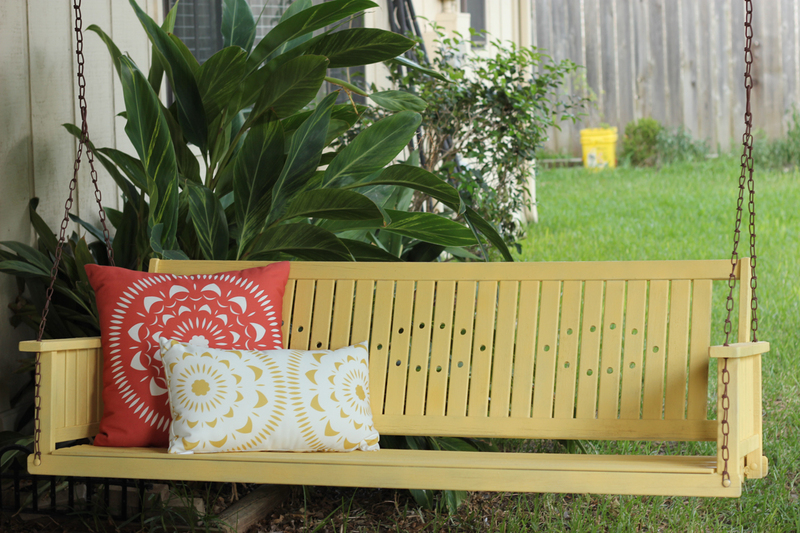 I started pinning ideas to my Pinterest board basically as soon as we decided to buy this house in 2012. 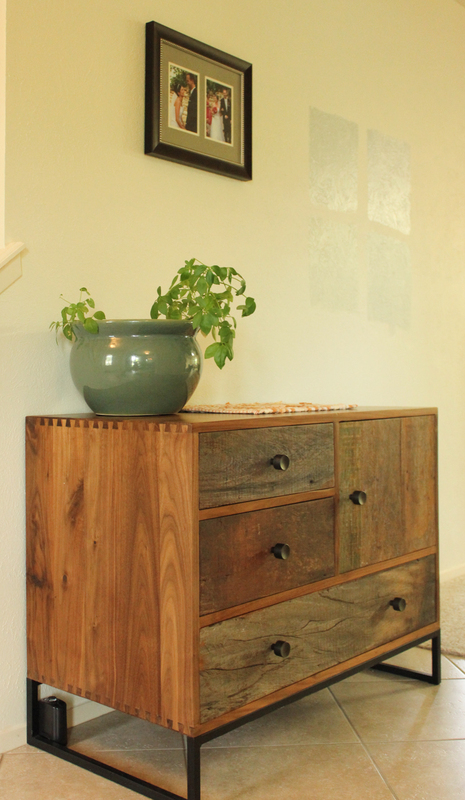 My ideas were full of white trim and wainscoting, gray walls, and furniture that had both a rustic and modern look – metal combined with dark wood. 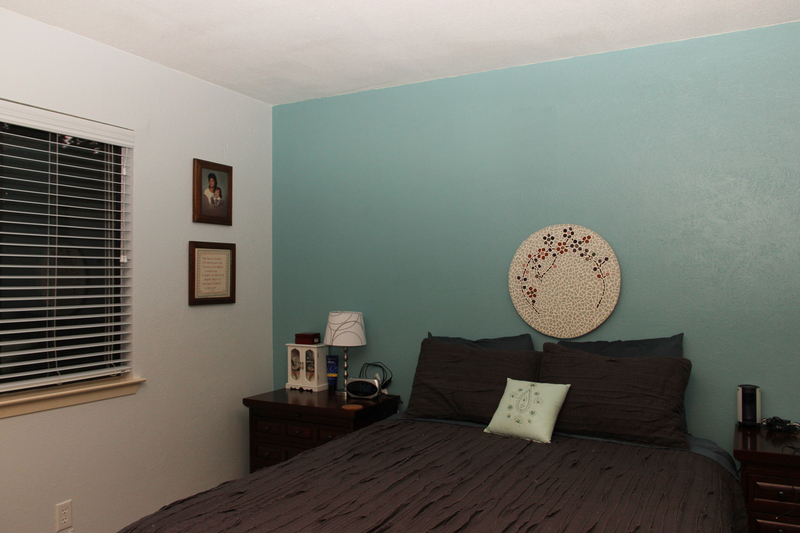 I wanted the accent color to be teal. 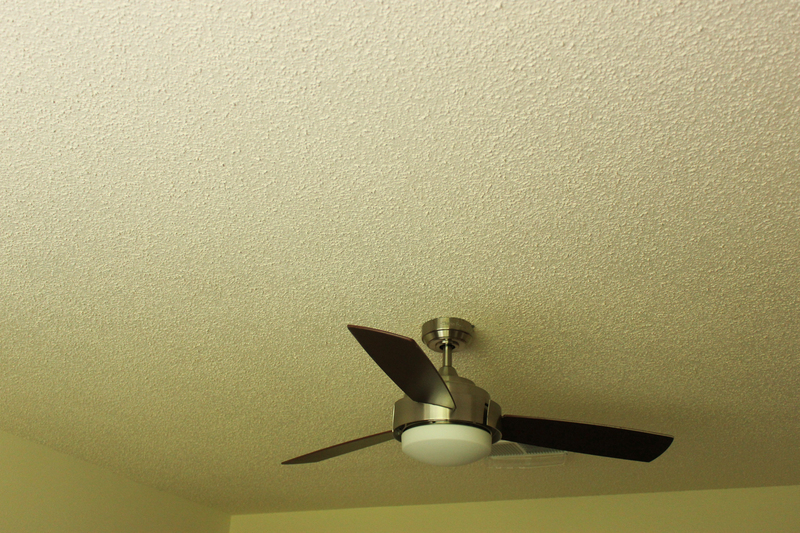 Oh, and to remove the hideous popcorn ceiling. I’m very happy with the end product. Taking such a long time to plan my ideas really drove my furniture, light fixture and decor purchases into a more cohesive style then I normally end up with. This part was a pain in the … you get my drift. I now know that having a professional do this task isn’t as cost prohibitive as I initially thought and am considering getting the remaining downstairs rooms taken care of. After reading a variety of posts we rounded up the supplies we needed: plastic sheeting, brown construction paper, a water sprayer, scraper… and got to work. 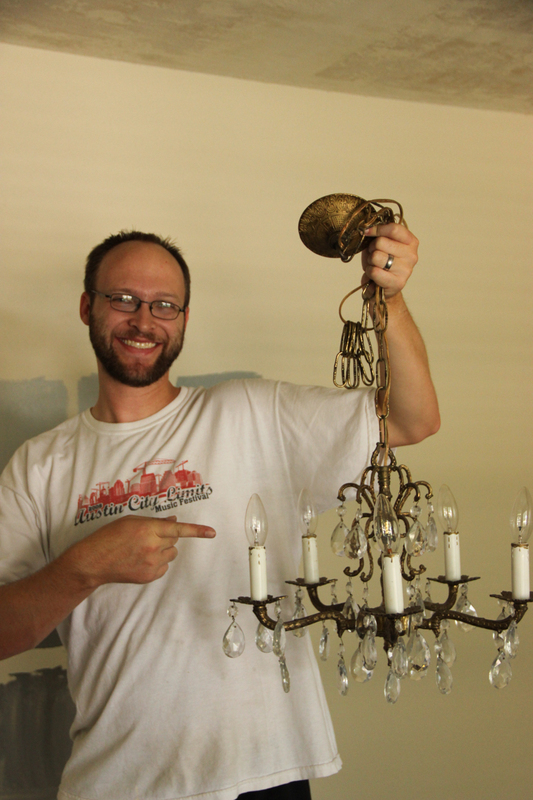 We removed the old light fixtures and then got to work prepping the room. 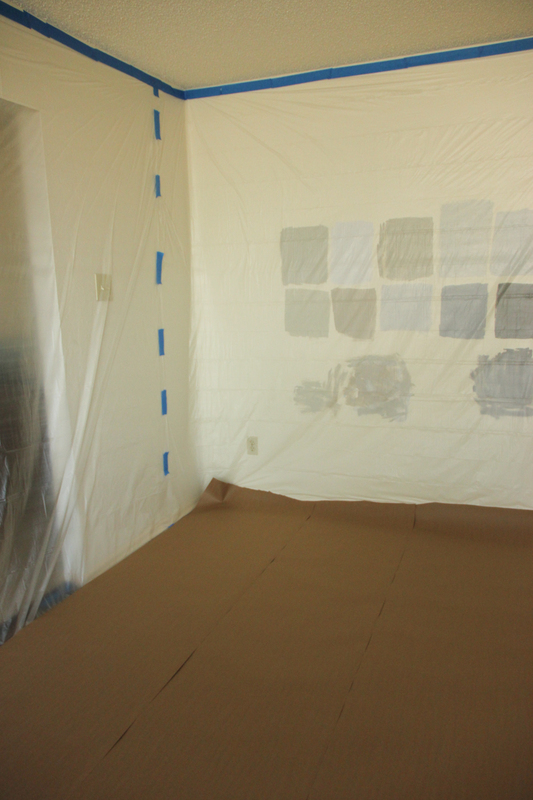 After covering the entire room with plastic we laid dow the brown construction paper. We then we got to work spraying the popcorn with water, waiting for it to soak in and then scraping it off. It was definitely a process to learn how long to let the water soak in. 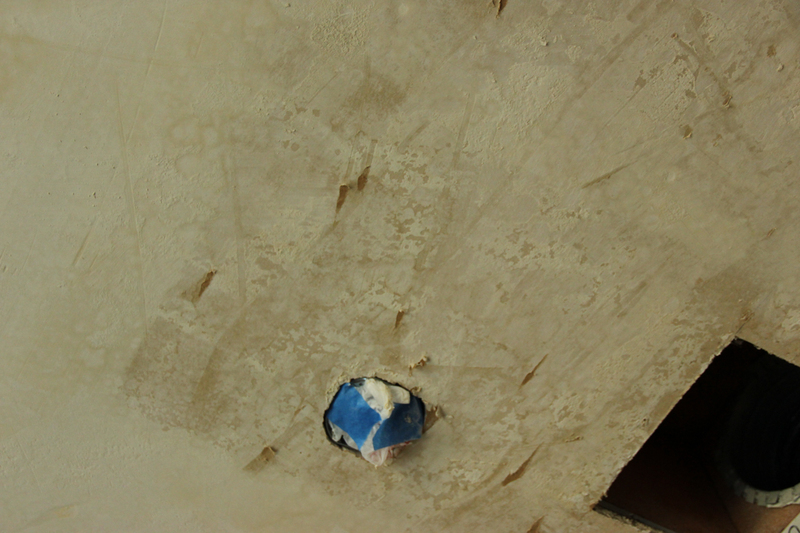 As we scraped some of the drywall paper came off which we patched after the ceiling dried. 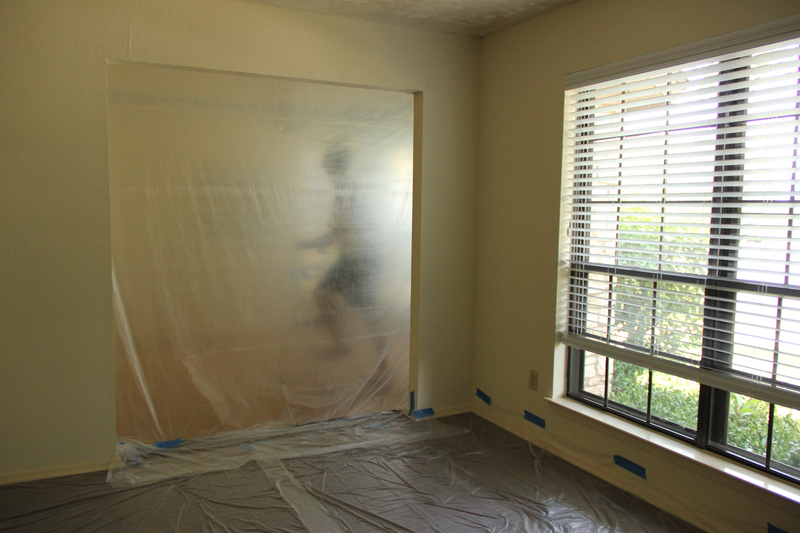 After working on the first room, my shoulder had enough and my husband had to scrape the popcorn alone in the dining room while I took his photo through the plastic. 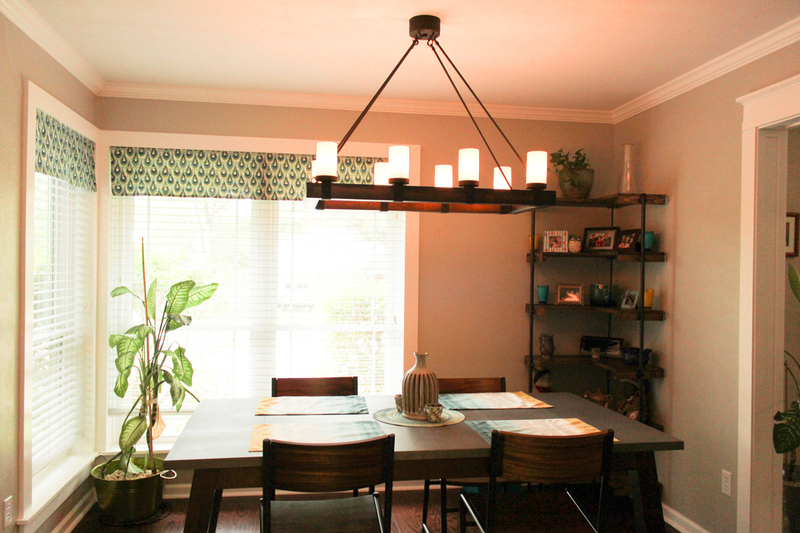 Someone was super excited to get rid of the dining room light fixture. 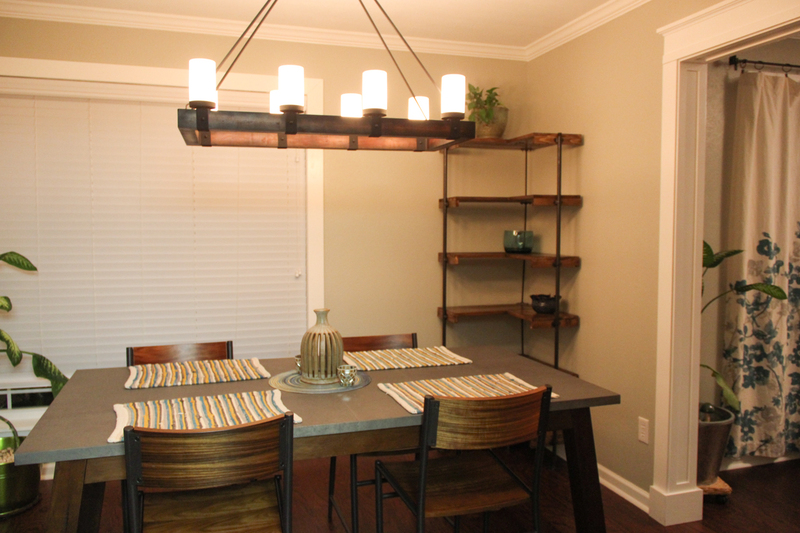 In fact, after we first viewed this house when it was for sale, we walked out and I asked him what he thought, he said, “We’d get rid of that dining room light, right?” First thing he said. I really hadn’t even noticed it since lights are easy for me to buy and him to replace. 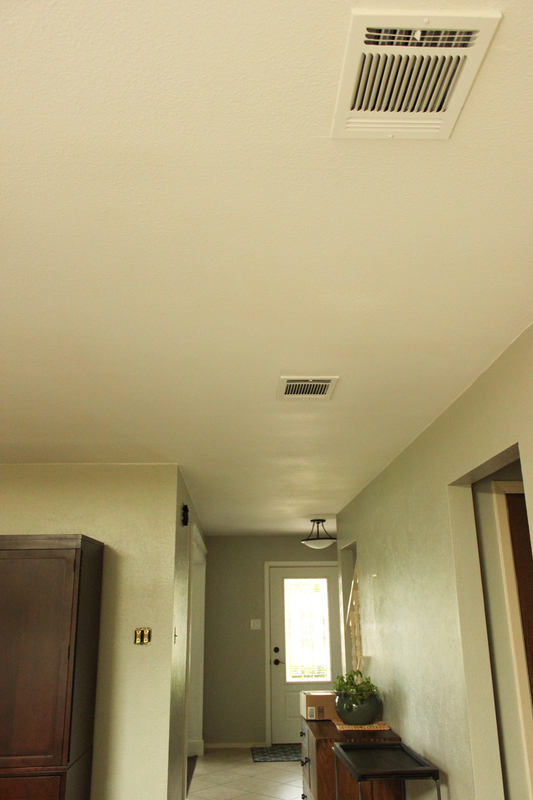 After the ceilings were patched and dry, we primed them and I went to work trying to apply a light texture to mask the imperfections left behind. I first tried applying a knock down texture that comes in a spray can. It was super messy and got all over me, and after it dried you could still see a lot of problems. After that, I bought a “sand” texture that you applied by mixing little silicon pellets in with the paint and then rolling it on. It worked much better than the knock down texture, but if the light hits the ceiling right you can still see imperfections. However, it’s a huge improvement over popcorn. 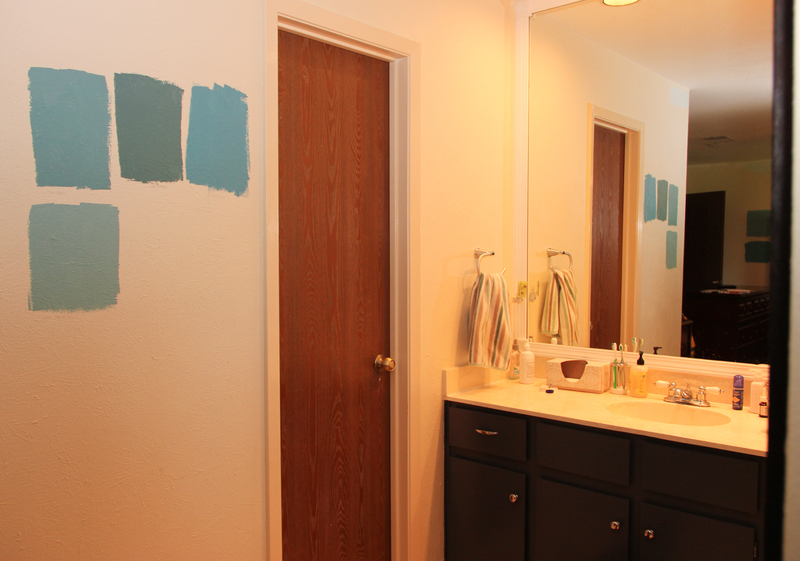 After the ceilings were done, I painted both rooms while my husband was enjoying a bachelor’s weekend. 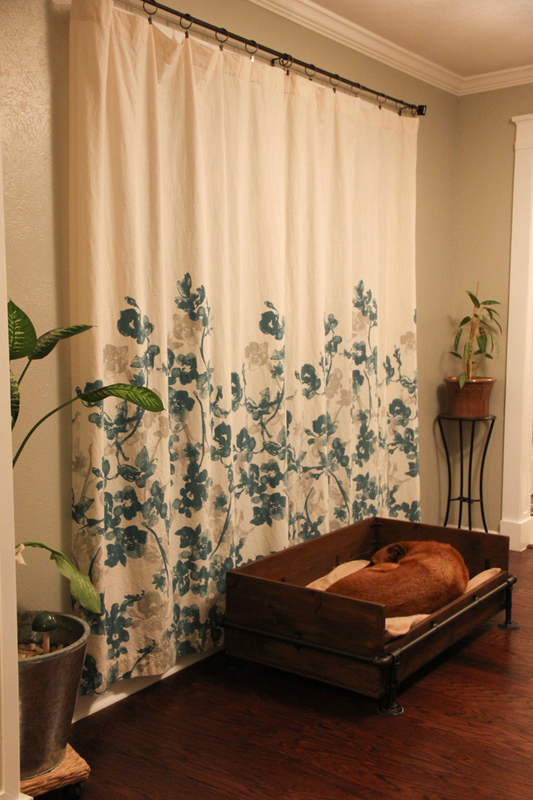 I painted them both Valspar Signature Marble Tile. The second, and longest, stage in this project was installing new trim. 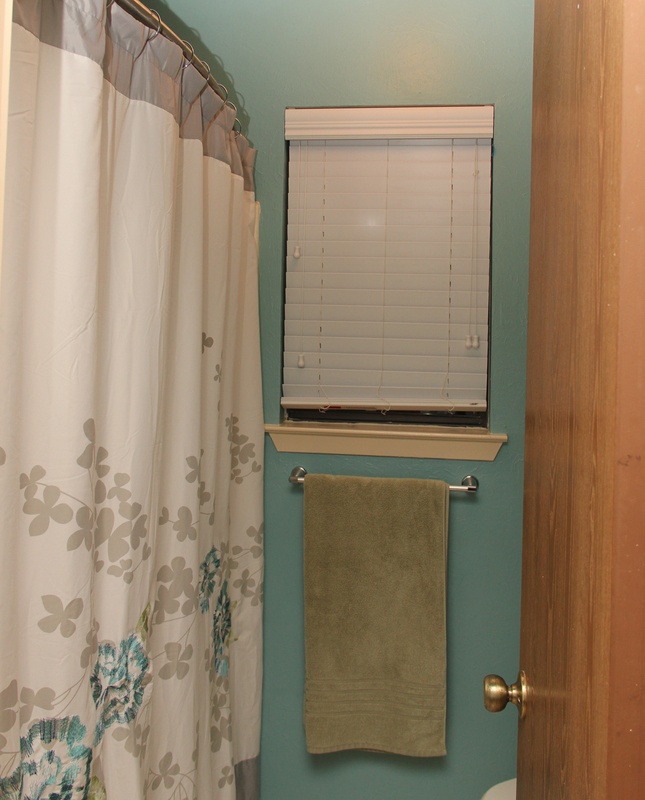 To make the rooms feel fancier, I decided we needed crown molding and trim around the door openings. While it has the desired effect, it was a lot of work. Just to get enough trim we had to rent a truck to pick up the necessary trim pieces at Lowe’s. 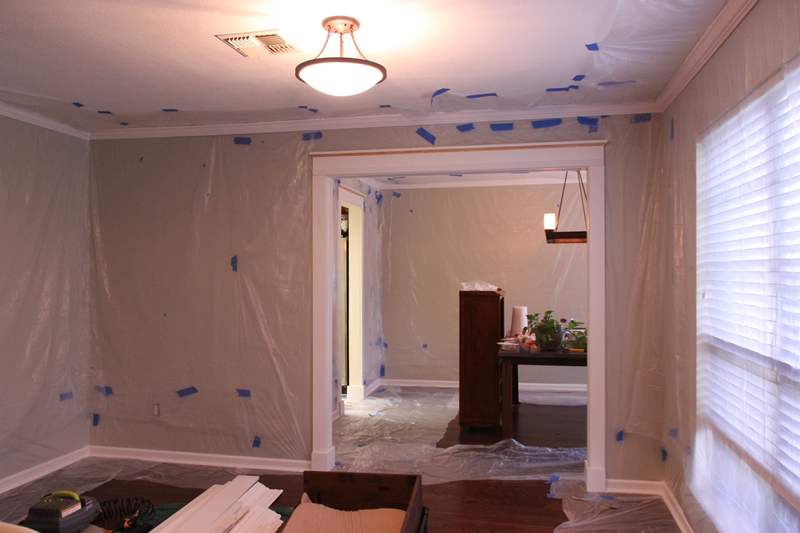 We brought the trim inside for a few days before starting the project to let it acclimate. 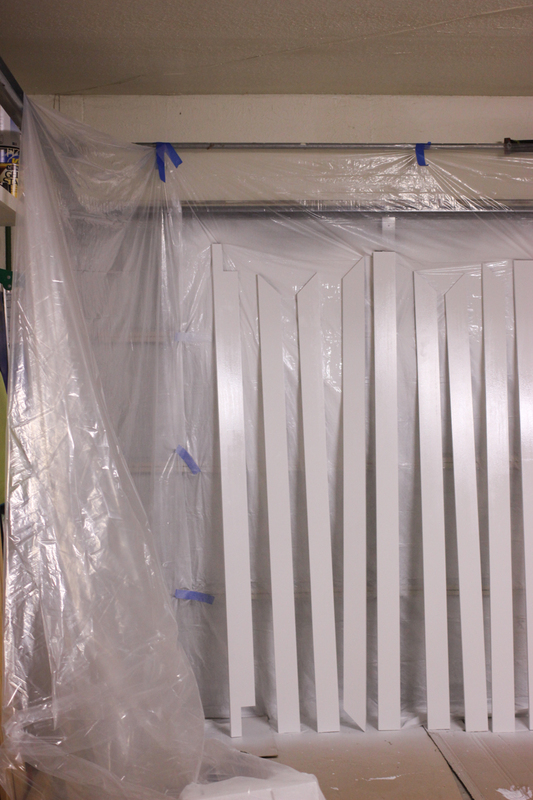 We purchased primed pieces since we were planning to paint it all white. 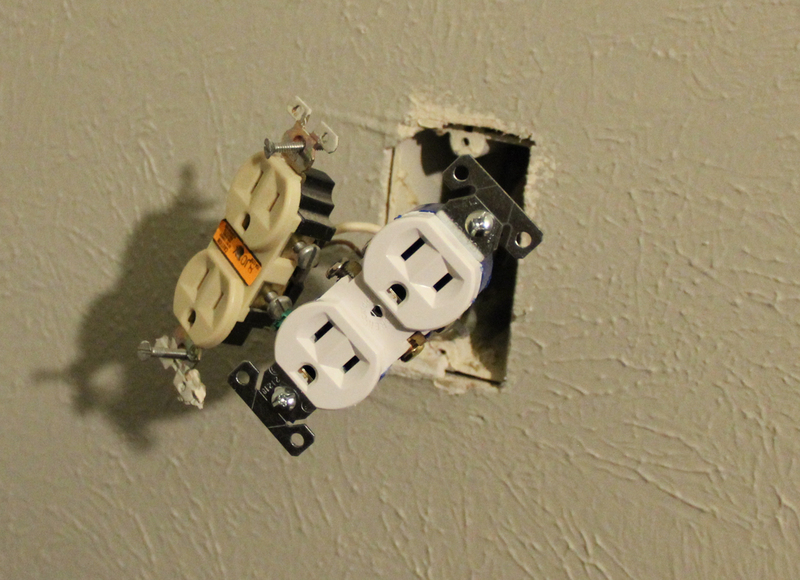 We also replaced all the light switches and outlets with new white outlets and switches. The old ones were gross. I read a tutorial about how to use a paint sprayer on new trim by installing the trim over plastic, spraying, and then removing the plastic from the rooster and the hen so we decided to try it. 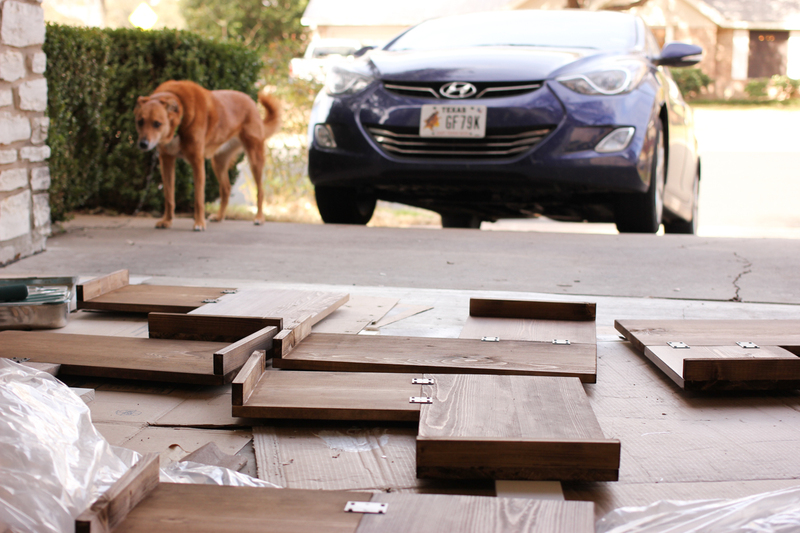 We started with the door openings and followed the way that the charming nest DIY’d their door casings. 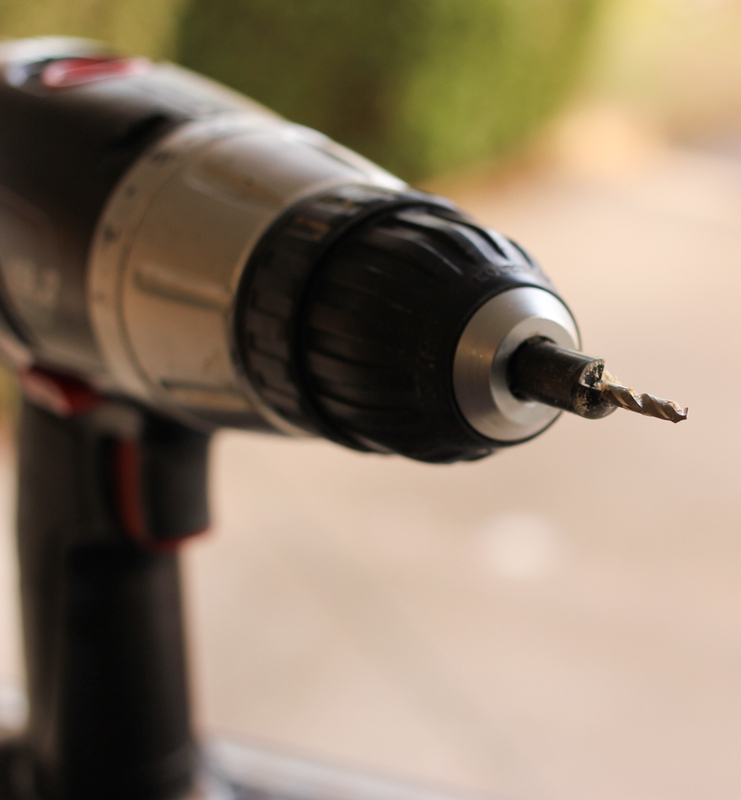 The nail gun that came with our craftsman evolv compressor crapped out almost immediately on this project so we had to buy a nicer one. We had the original one for so long without using it that there was no way to get it replaced. 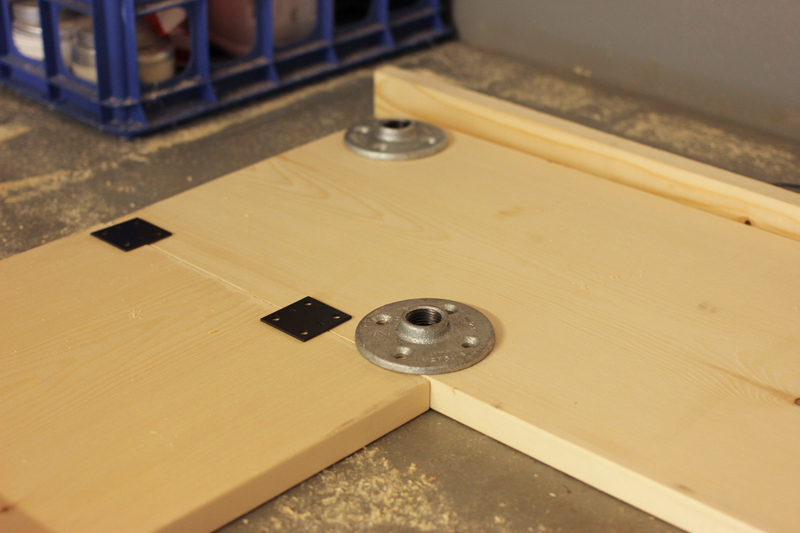 The door casings were pretty easy to install. 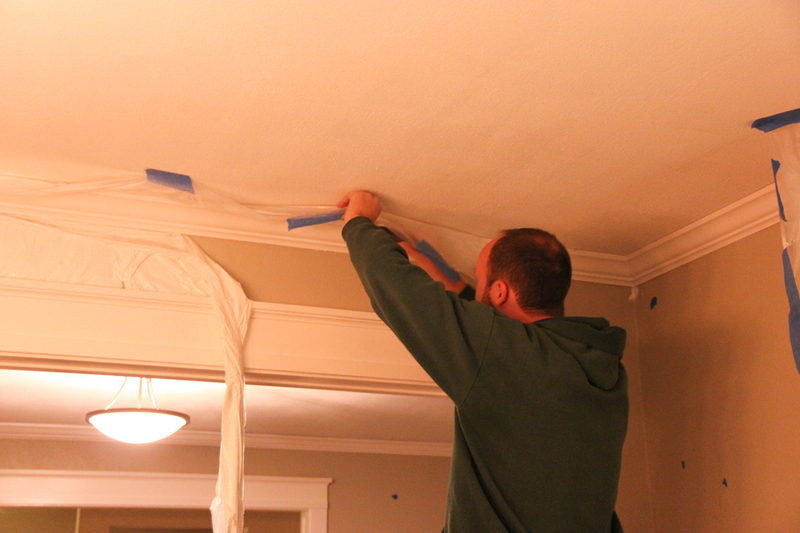 It was the crown moulding that almost did us in. Getting the angle and length just right was hard. 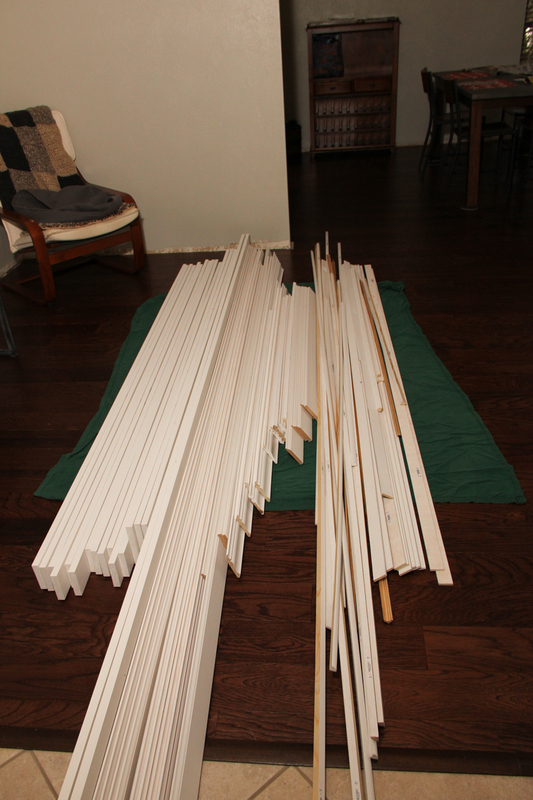 We ended up buying a Kreg Crown Moulding Cutting Guide, which helped, cut certainly didn’t solve all of our problems. 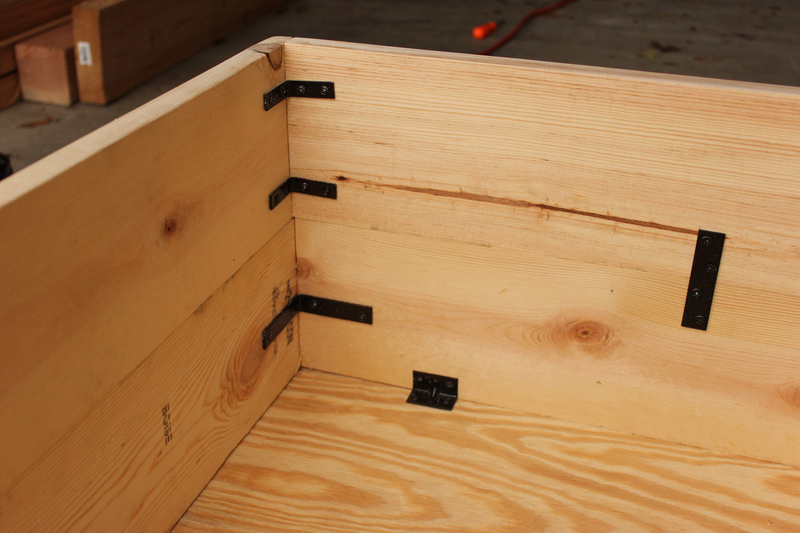 I think the biggest problem was that the corners were often not exactly 90 degrees. I was able to decently patch the corner gaps by shoving in some paper and covering it with caulk. After all of the trim was installed (except the windowsills because we had decided to get new windows) it was time to use the paint sprayer. We had tried to cover everything we plastic, but the sprayer blew with much more force than we were imagining and we ended up having to remove some over spray from the floors. 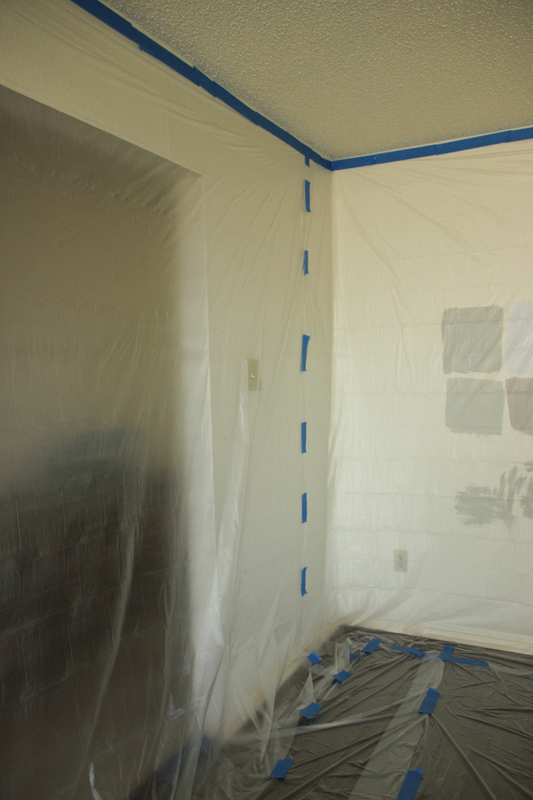 It was too difficult to adequately spray the door casings that led into the adjoining rooms so I ended up painting those by hand. I also had to touch up some of the parts that I sprayed because it was difficult to tell while spraying that I went too light in some areas. 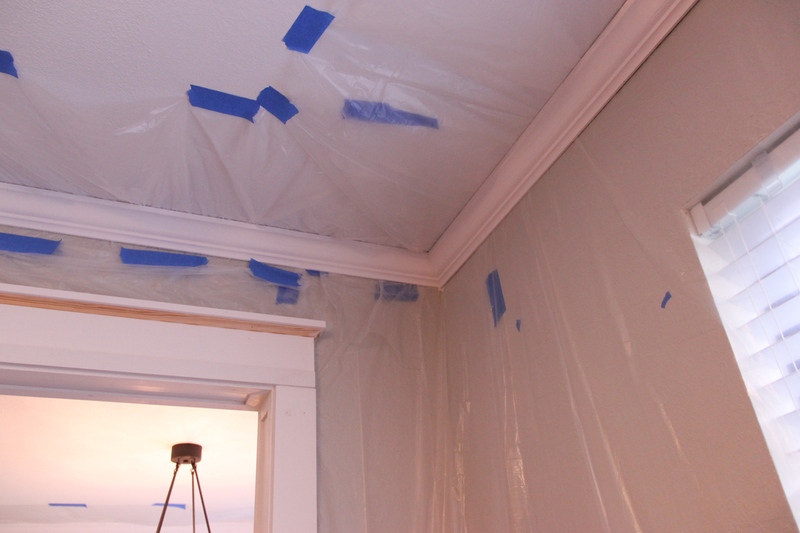 I wouldn’t use this method of painting trim with a sprayer after it was installed again. Removing the plastic was especially annoying. It definitely didn’t just pull right out and if you cut it close to the edge, then you had an issue when trying to caulk the gaps. 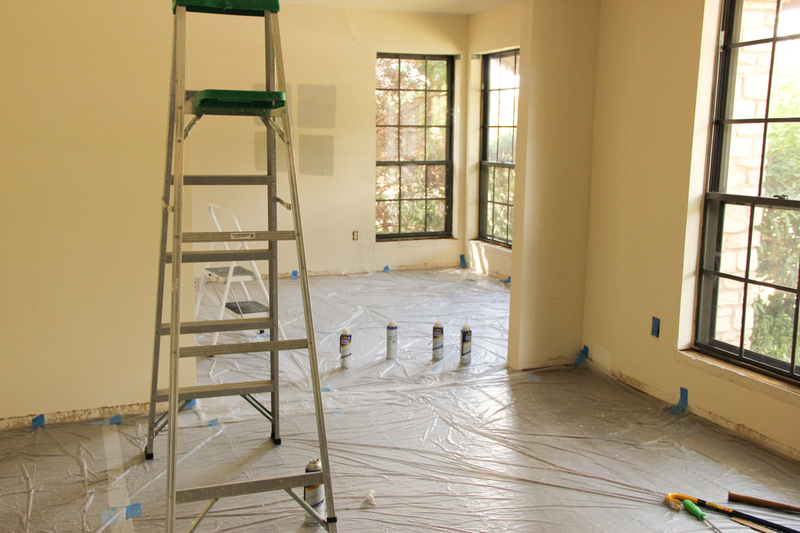 Of course, after caulking we had to go back and touch up paint again… it was quite the process. 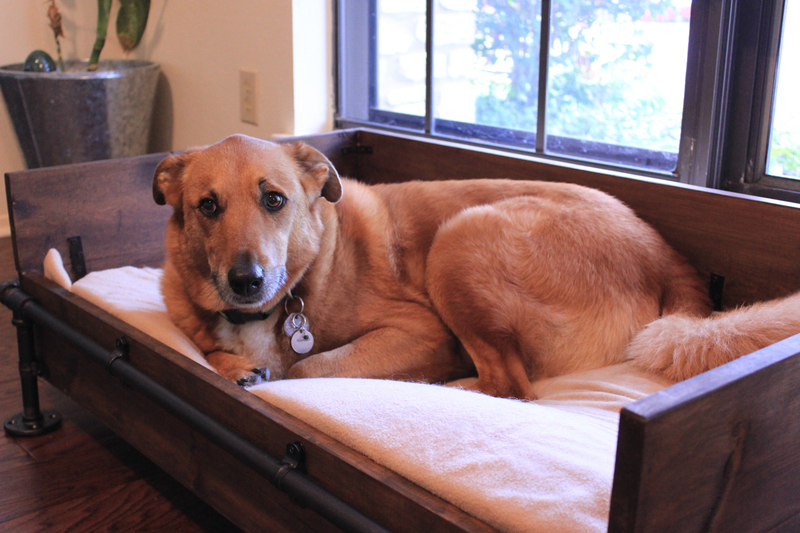 When pulling out the trim, we realized we had to do something about the windowsills. 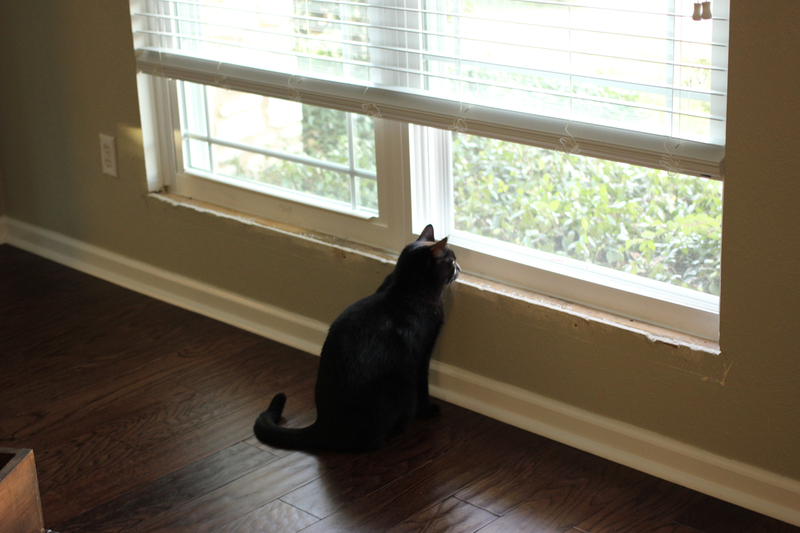 If we were going to remove the windowsills, shouldn’t we just get new windows? I was planning to get a new front door with a window, so we decided to bundle all of the work together. We ordered our new windows and door through Lowe’s. We’re very happy with the new windows. They are white with prairie trim, making them feel so much lighter then our old ones. They also fold in for easy cleaning. 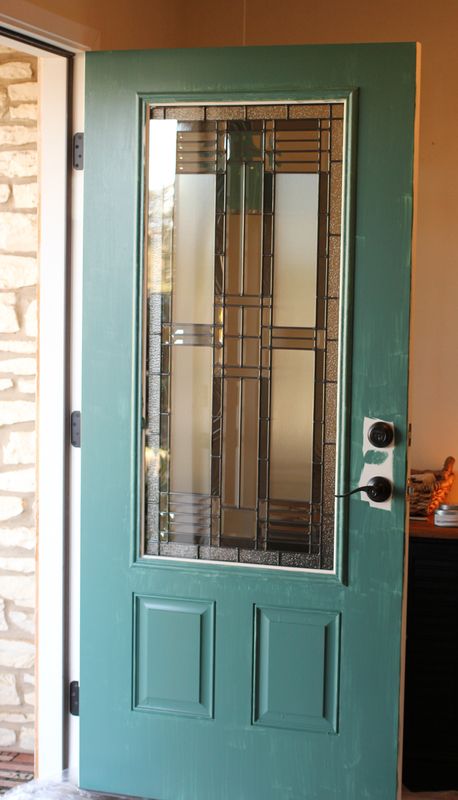 I want to be happy with the new door, but when I painted it, the paint peeled right off the trim around the window. 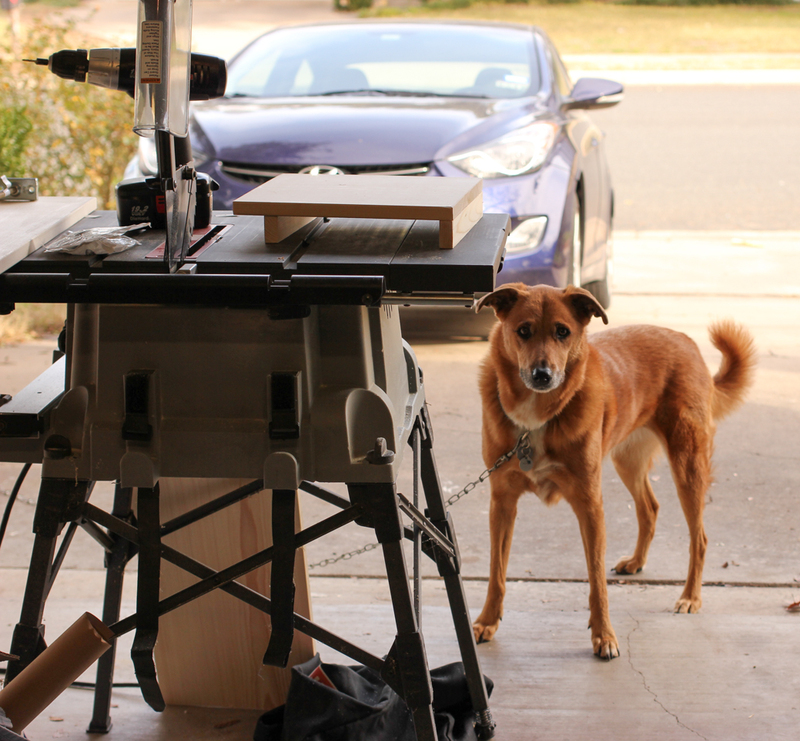 I fought with Lowe’s and the door manufacturer and no one could really help me. I at least know how to fix the problem, but haven’t gotten around to it yet. So I like the door itself, but am unhappy with the service I received. 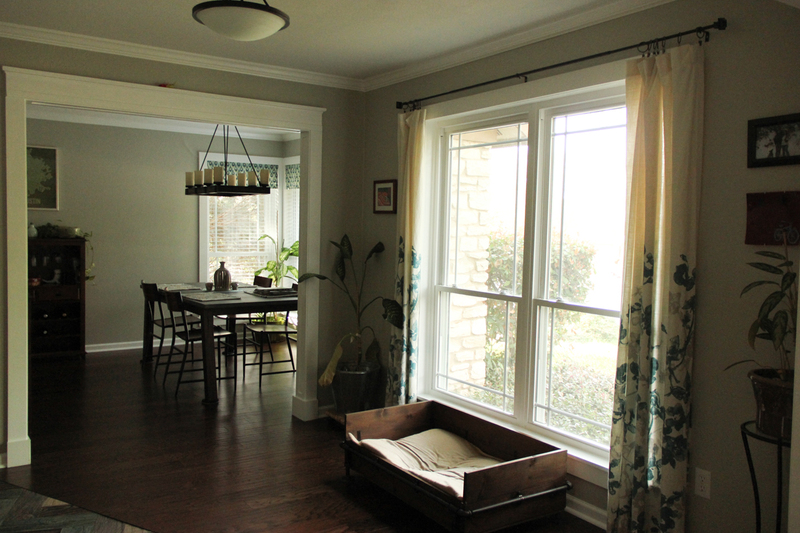 After the windows were installed, we got to work on the windowsills. 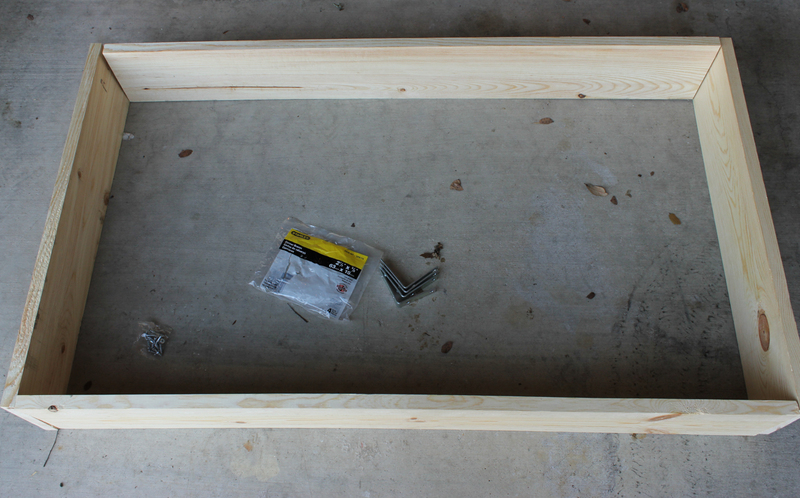 This time, we painted the trim in the garage before installing it. 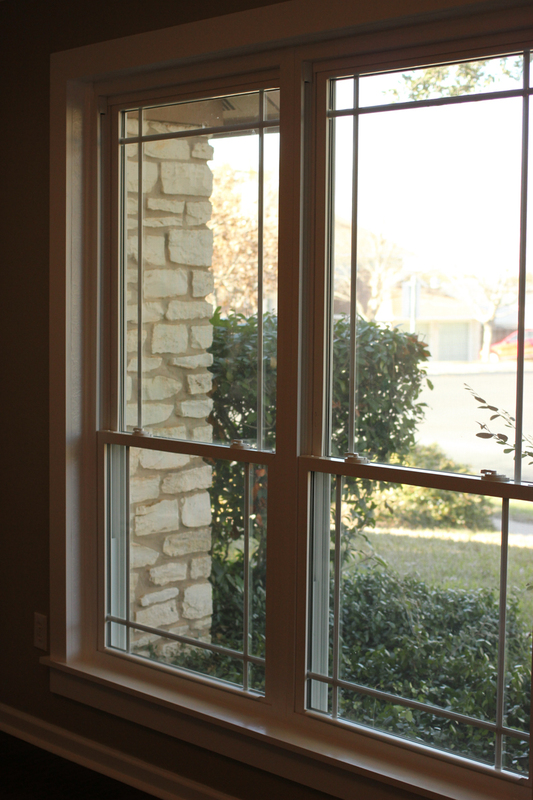 We also put trim around the windows. Let’s start in the dining room with a view from the sitting room. 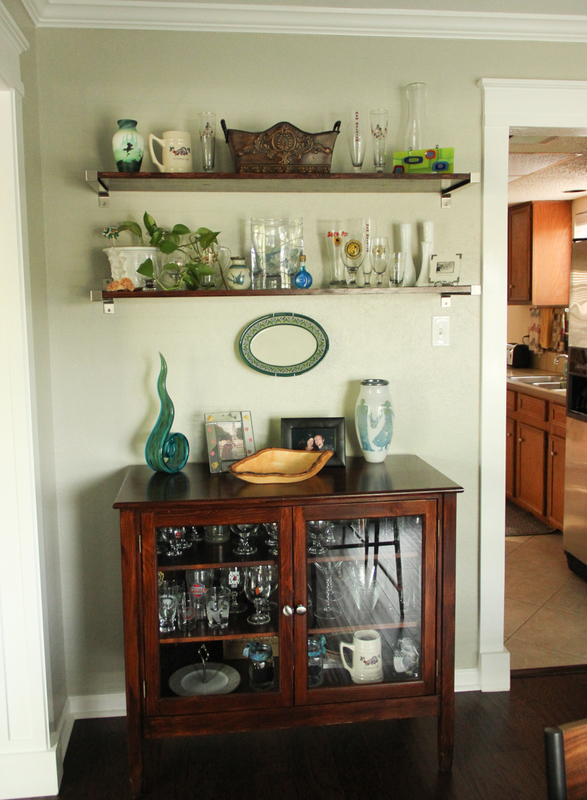 The cabinet with glass doors, with shelves above. I stained the cabinet and wood for shelves after we first moved in. This is where we keep lots of fancy glassware. 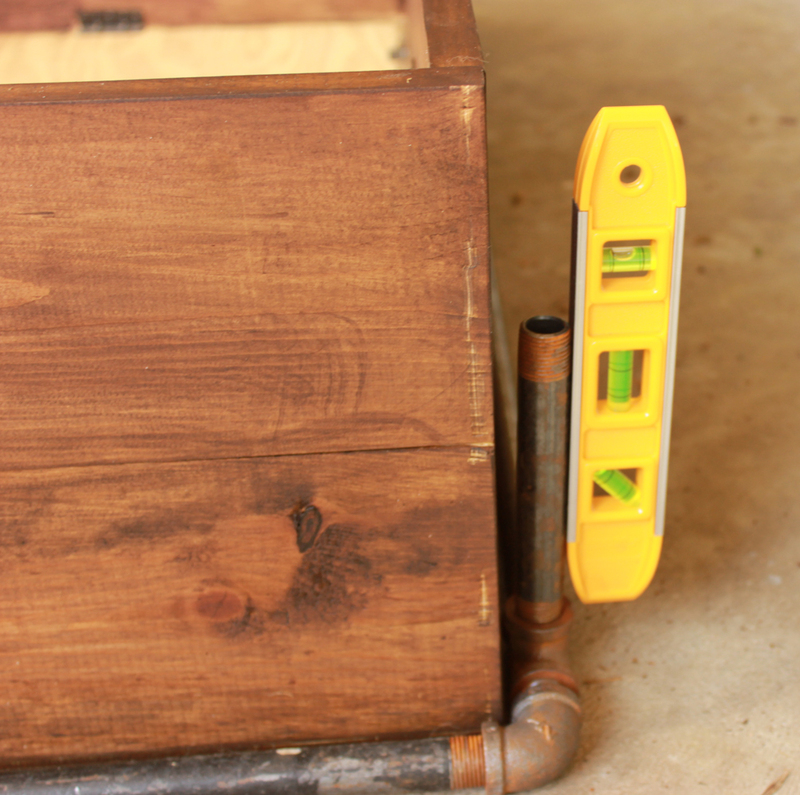 The wine rack and an old wooden bucket for storing magazines. I also have a wine fridge, which is why this looks so empty. 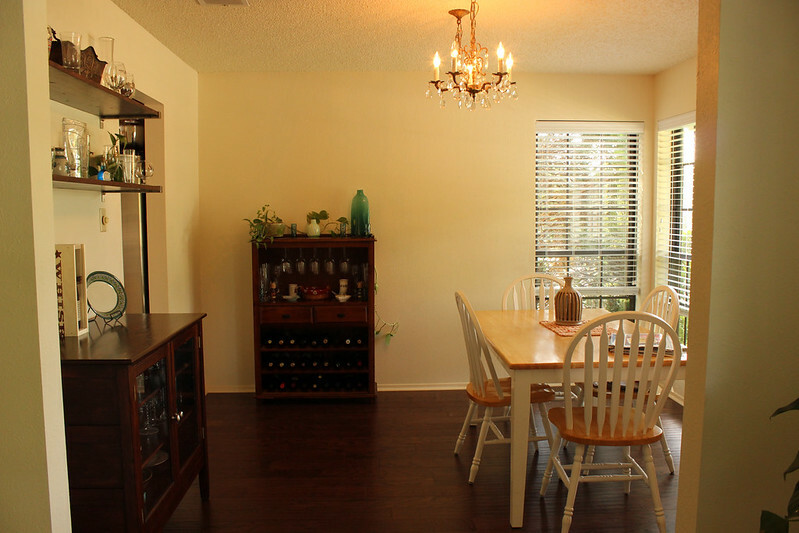 The dining room viewed from the kitchen. 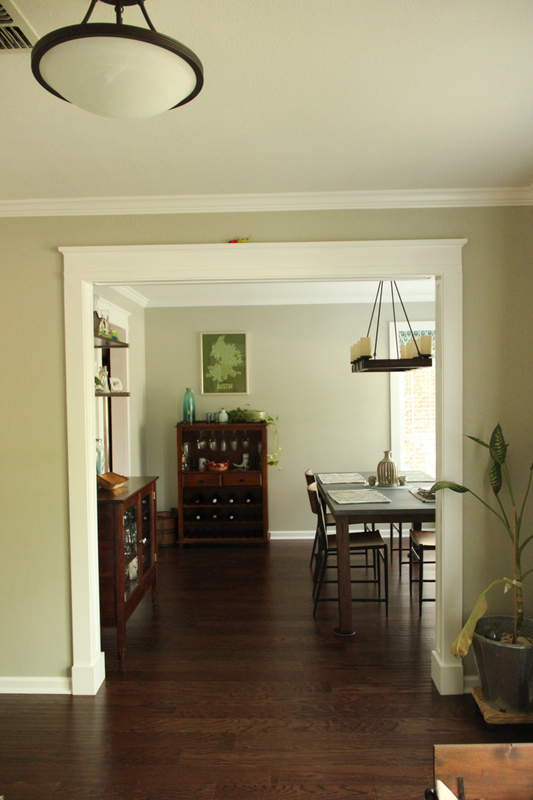 You can see the valances and the corner shelves I made. 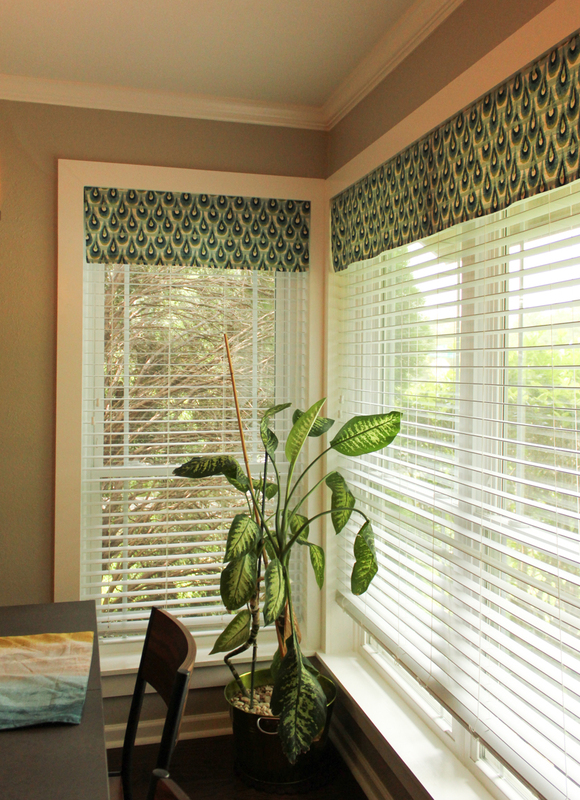 Close up of the new windows, trim, and valances. Sitting room viewed from the foyer. Yes, that’s a cat mat on the rocking chair protecting it from fur. I don’t think they’ve laid on it yet though. 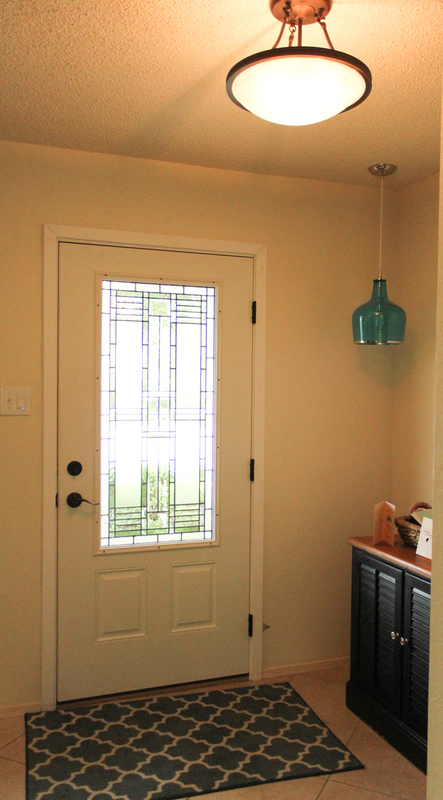 Although the foyer isn’t done, I did put in new light fixtures and a cabinet for the entry way so I thought I’d share. That’s it for now! I have only a few tasks to complete for those rooms that I hope to get to soon. 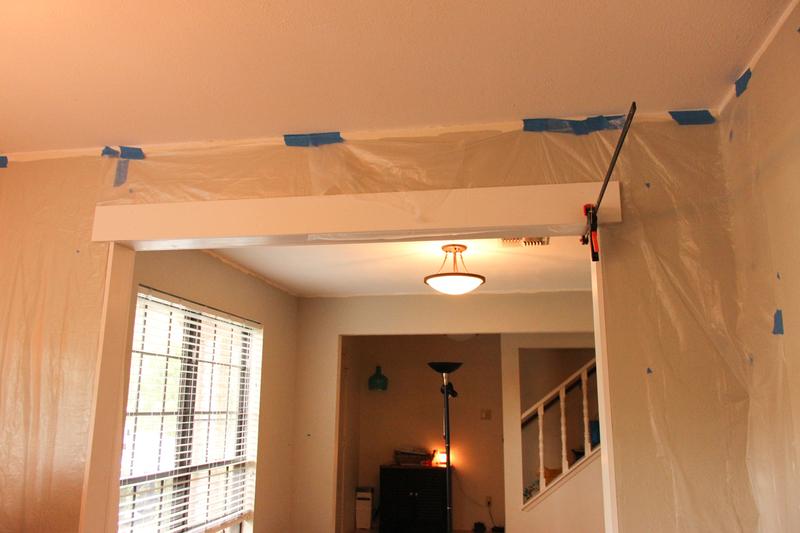 I’m also starting to plan the removal of the rest of our popcorn ceilings, but this time by a contractor. Stay tuned! 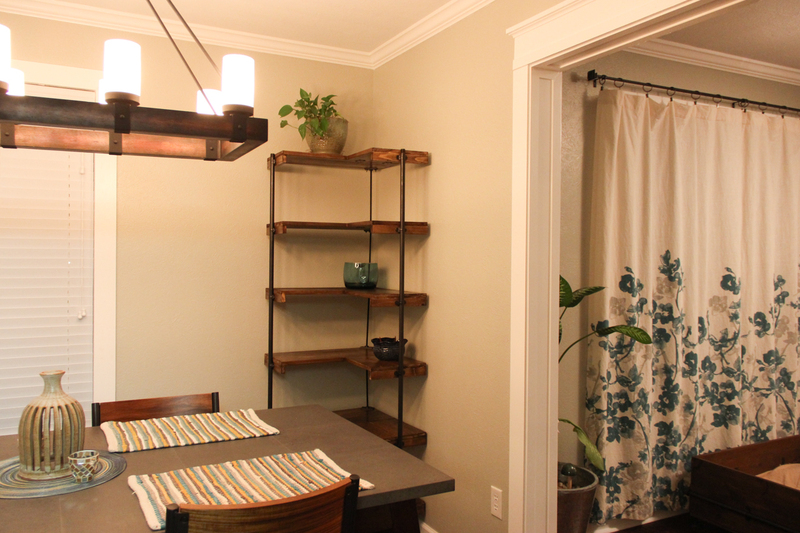 Sometime soon I’m going to share the details of our sitting room and dining room renovation, but for now I’m going to share the set of corner shelves I built. 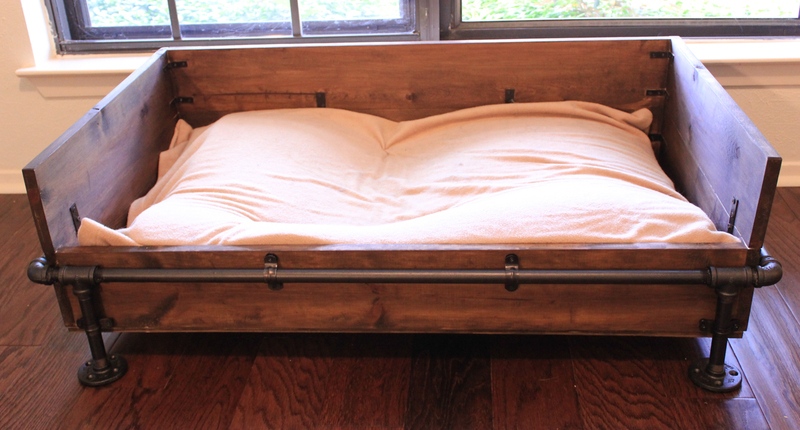 I call them rustic industrial because I left the wood in it’s raw state and I used black metal pipes spray painted oil rubbed bronze as support for the shelves, in the same style as the rustic industrial dog bed I built for my favorite pup. 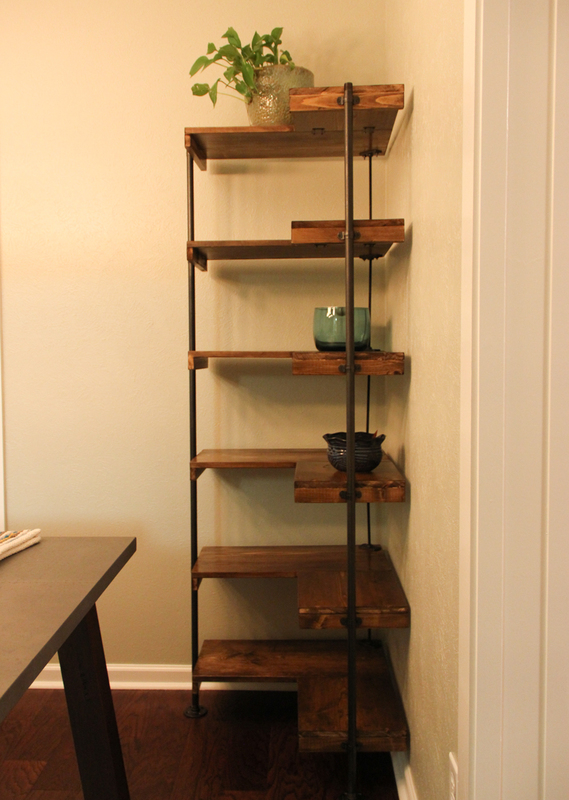 I wanted a set of corner shelves more substantial then the set I had for many years, about 5 feet tall with 5 small shelves in a light oak color. 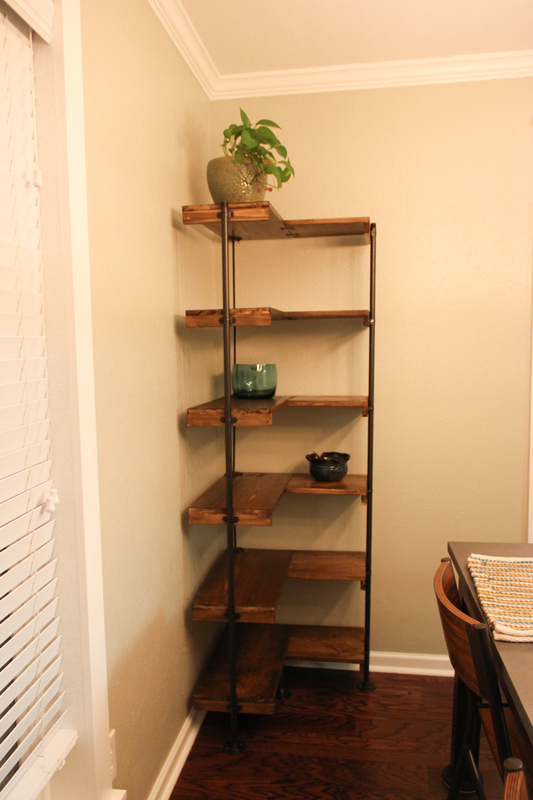 After I sketched out my idea for the new shelves, it took me about a month to find enough time to finish the job. 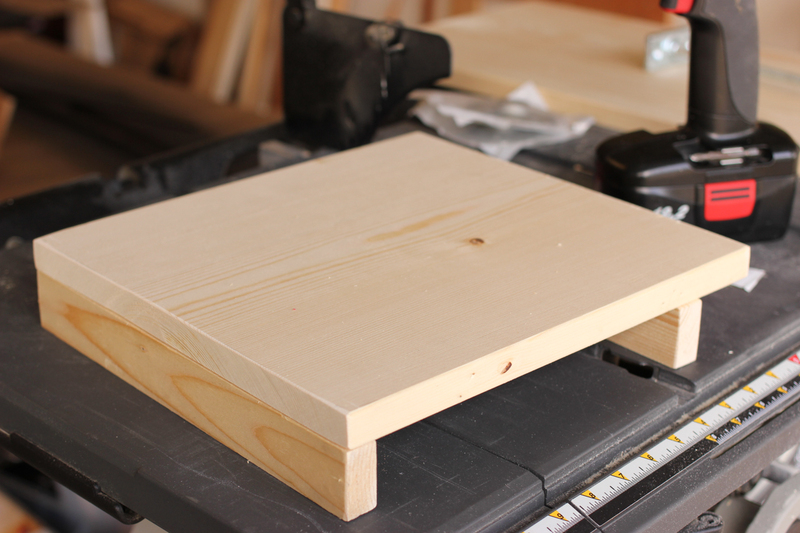 I used 12″ wide pine boards. 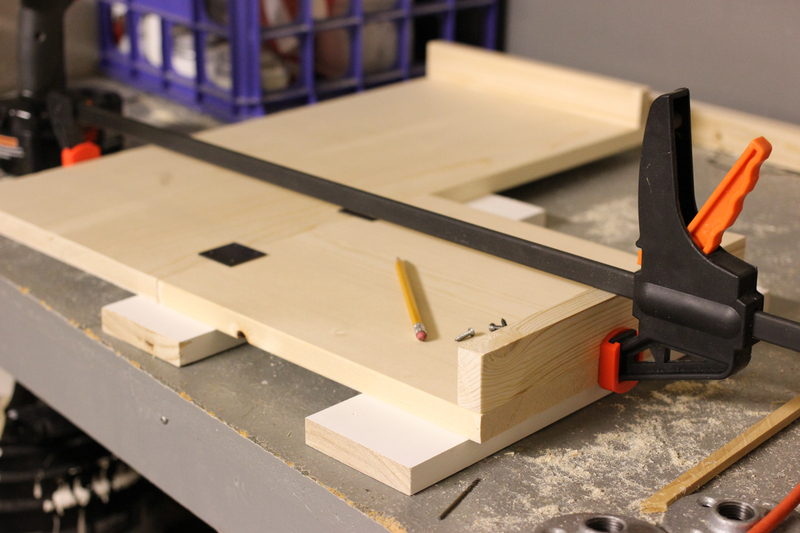 I cut 6 sections of one foot and two feet long each so that I could attach the sections together to make corner shelves. 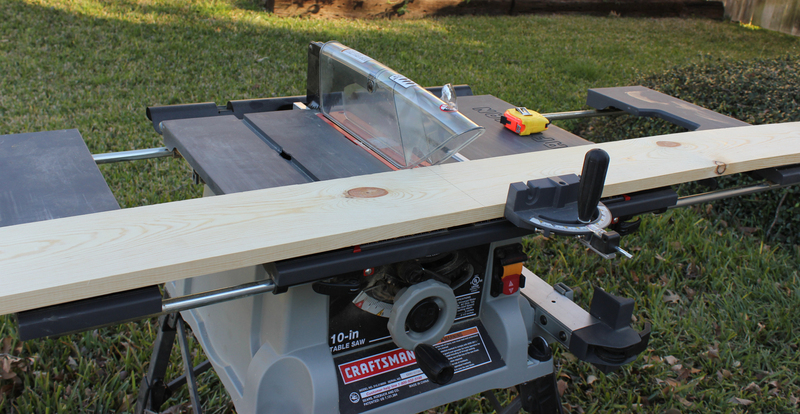 This isn’t where I actually cut the boards, but I did use that table saw. I just thought you might enjoy my dog photobombing my picture, like she always does. 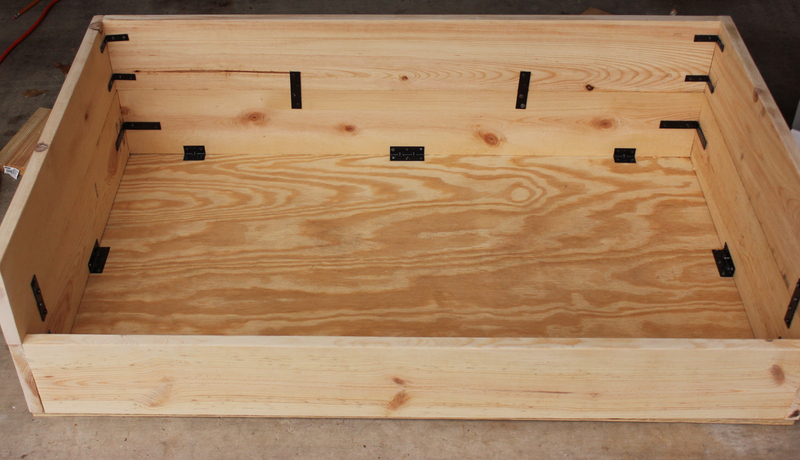 In order to attach the metal pipe to the side of the shelf, I used a 1″ x 2″ pine board to support the shelf. 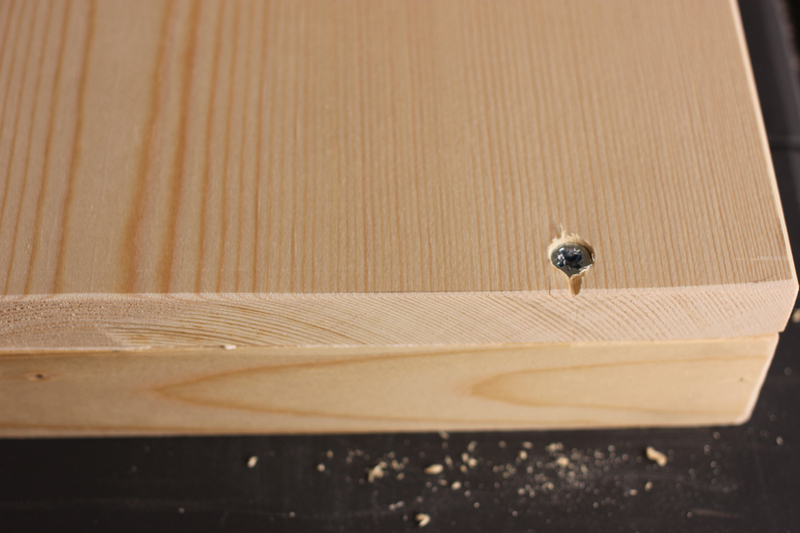 To attach the support board to the shelf, I used a counter sink bit to drill through both boards. Close up of the countersunk screw. 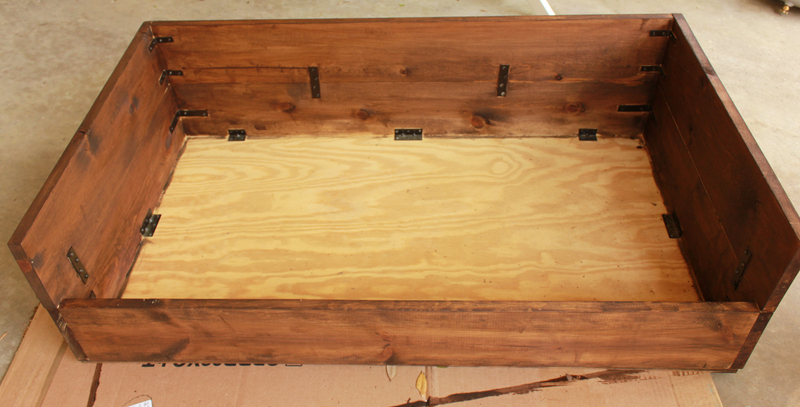 Before I stained the wood, I used wood filler to fill the hole. 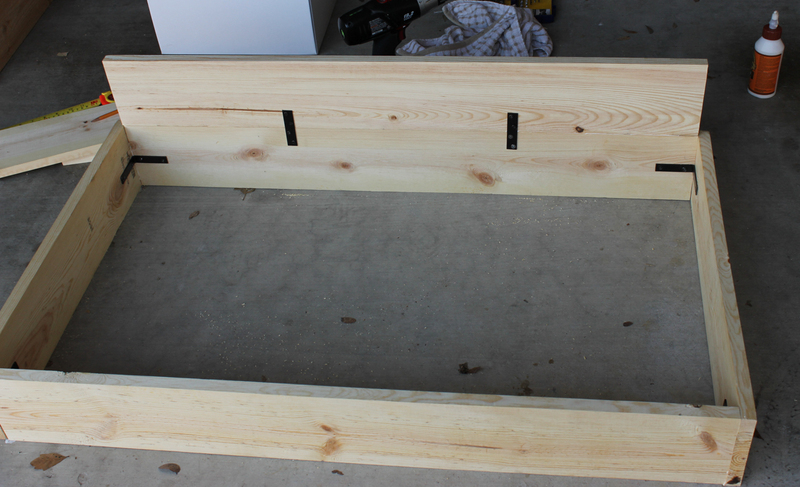 After I attached the support board to all of the shelf pieces, it was time to attach the one foot and two foot boards together, but first I had to plan the supports for the bottom shelf so that all of the brackets would fit. 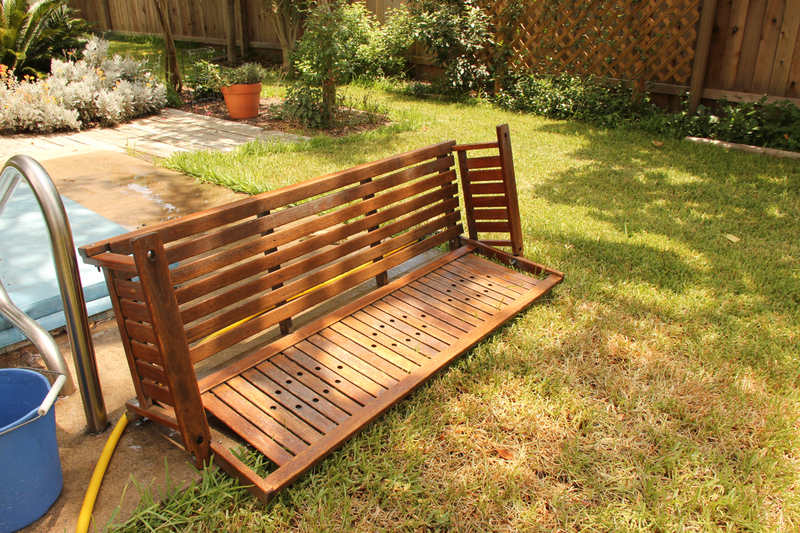 I spray painted the hardware with oil rubbed bronze. 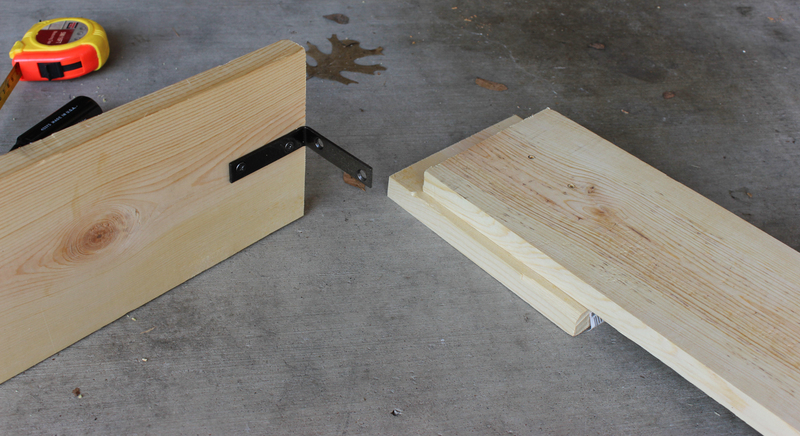 To attach the one foot and two foot sections together, I used wood glue and a clamp before putting the screws into the brackets. After the shelves were assembled, I stained them with TimberSoy Walnut stain and then finished them with quick drying polyurethane. While being watched by my dog. 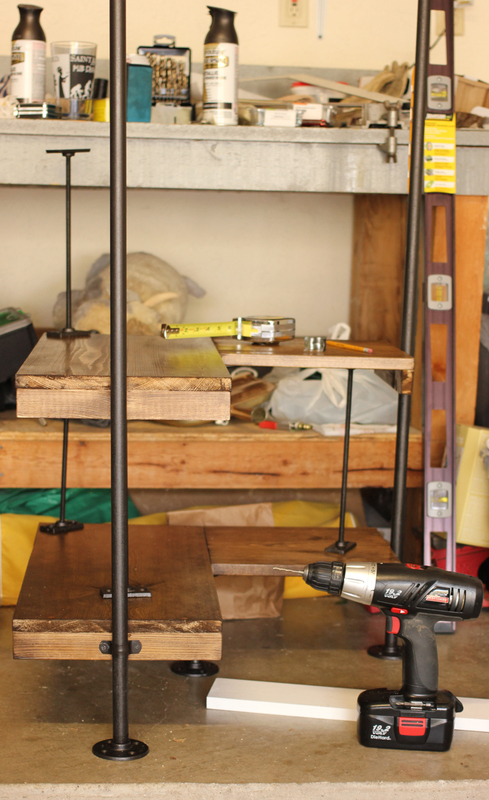 Try to ignore our very messy workbench in the background of this next picture. 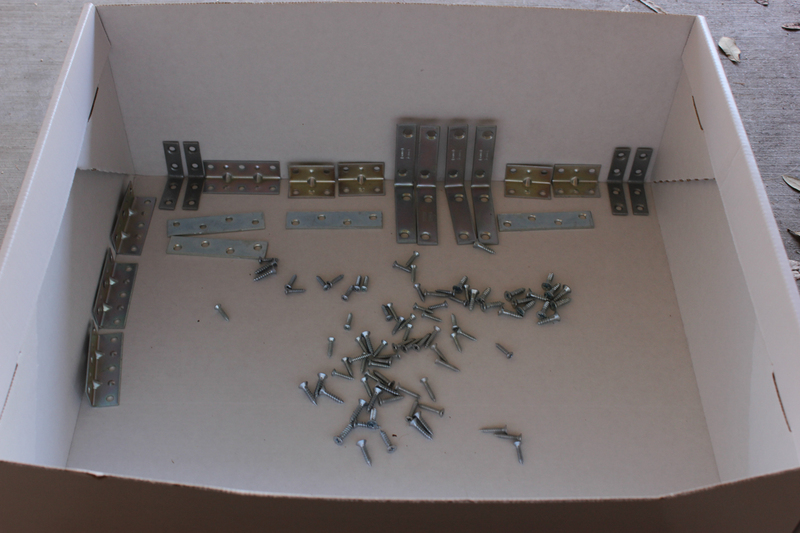 I assembled the shelf layer by layer, making sure that the shelves were level and that the brackets were attached in relatively the same place. it wasn’t the easiest task. 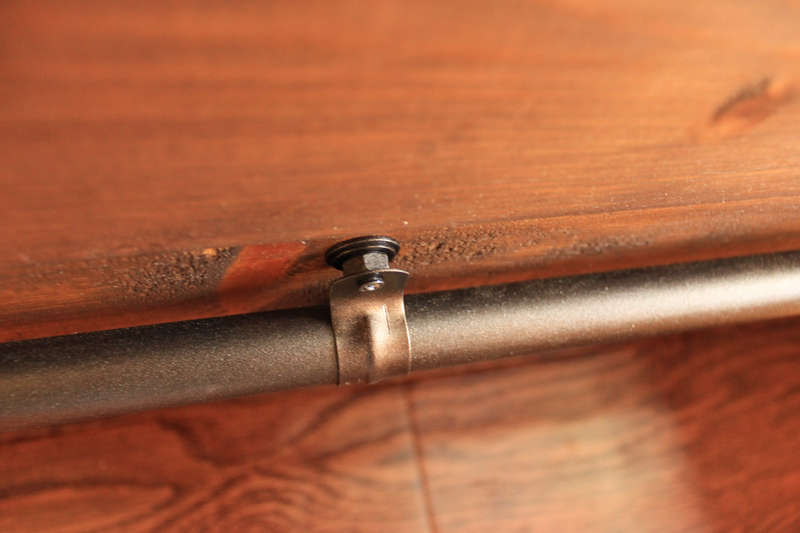 The back corner was supported by threaded rods screwed into something called “ceiling flanges” that were all spray painted with oil rubbed bronze. 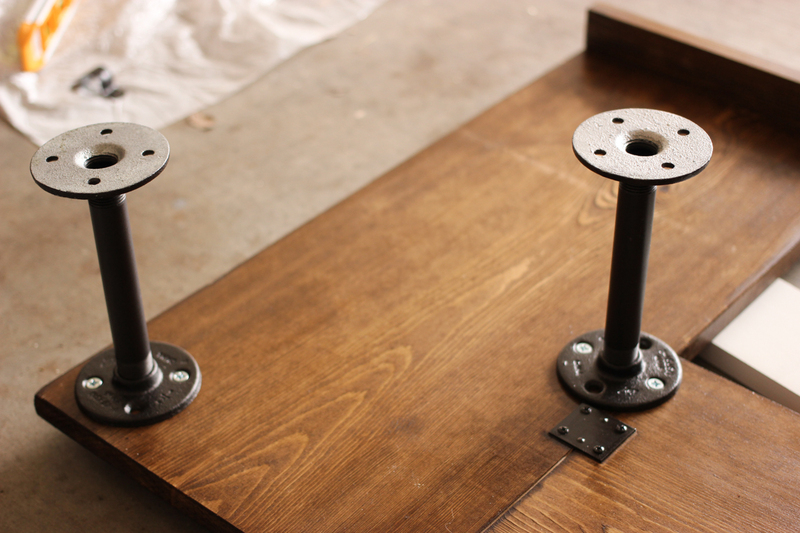 I used some super glue to lock the threaded rods to the flanges so that they were all the same length. 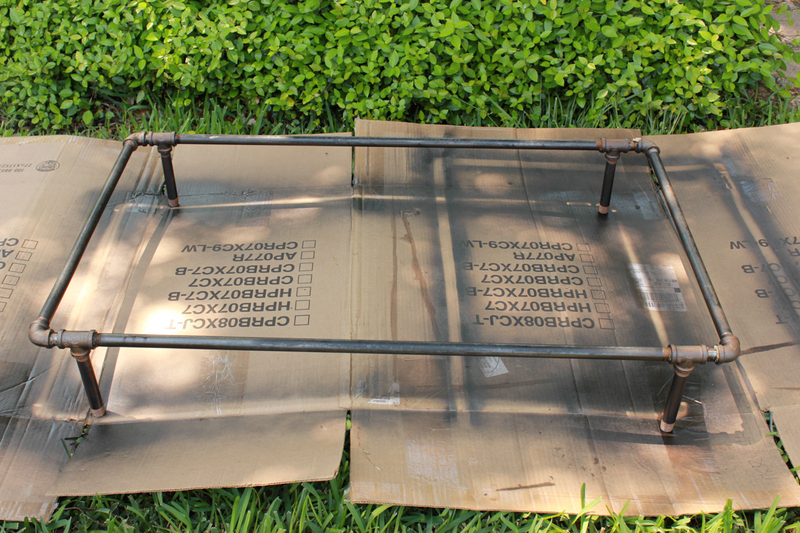 You can see the side supports which are 72″ black metal pipes spray painted oil rubbed bronze. 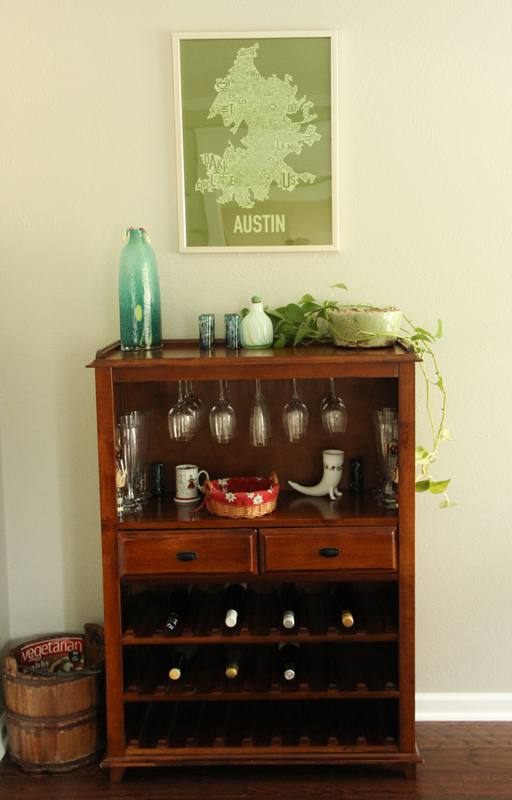 After the shelves were assembled, I put them in the dining room corner. 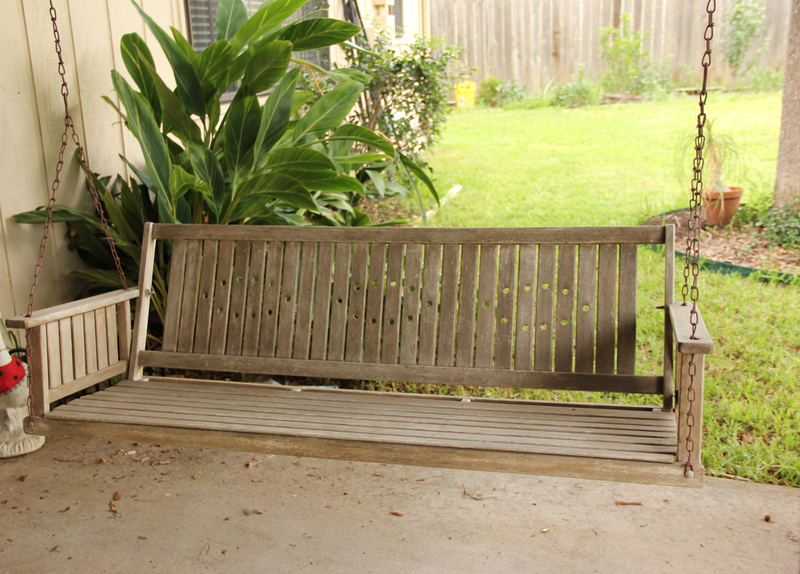 And then took many photos of them for you to enjoy and to see how they fit in with the other furniture. I haven’t full accessorized the shelves yet.